Two days riding brought me to Kremmling. This was familiar riding on roads I had cycled several times before. Nice to be back on the road again. Today the theme was “beat the wind”. While I did end up with headwinds much of the day, I still felt partially successful with almost no wind the first 10 miles. 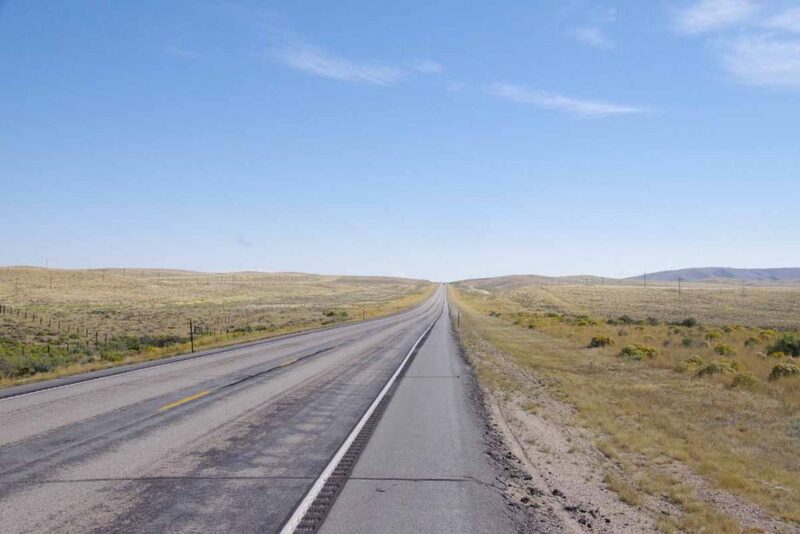 The ride from Laramie quickly becomes flat and open. I was in familiar territory and had done this ride multiple times before. 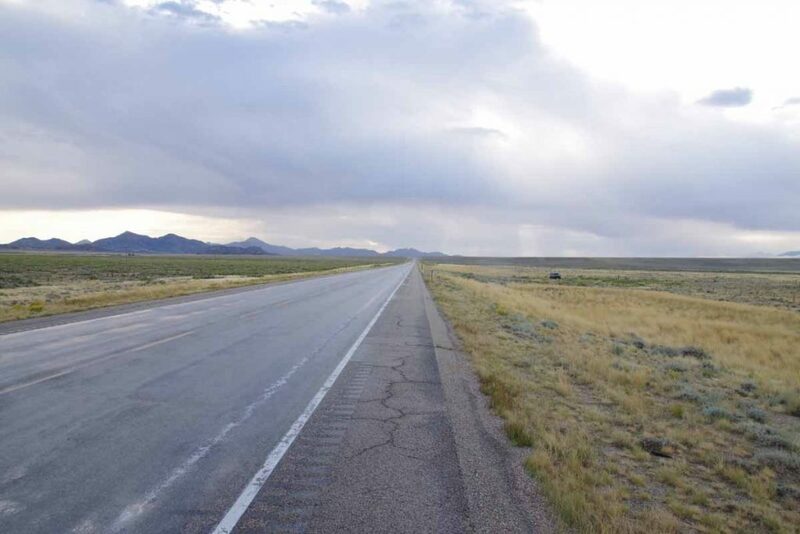 The first 26 miles were through wide open land where the wild card is the wind. It once took me 6 hours to cycle that distance with some ferocious headwinds. Fortunately it was calm starting out and lighter headwinds the last half of the distance. At Woods Landing, one trades the wind for 1000+ feet of climbing. I stopped in and talked with the clerk for a bit. She noted it had been rather hazy, most likely from some of the fires in the area. 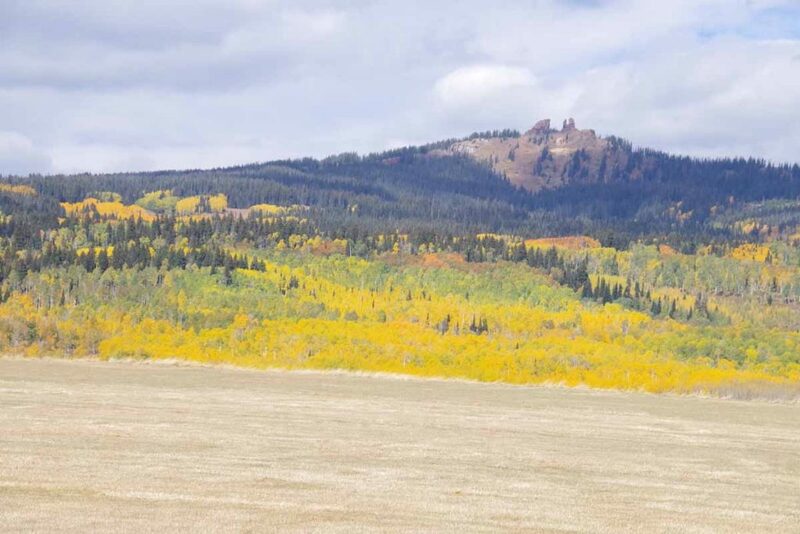 The aspen are beginning to turn. I climbed to slightly over 9100ft before having an occasional descent coming into Mountain Home. Not much later, I crossed the Colorado border. The first indication was the CO 127 road sign. 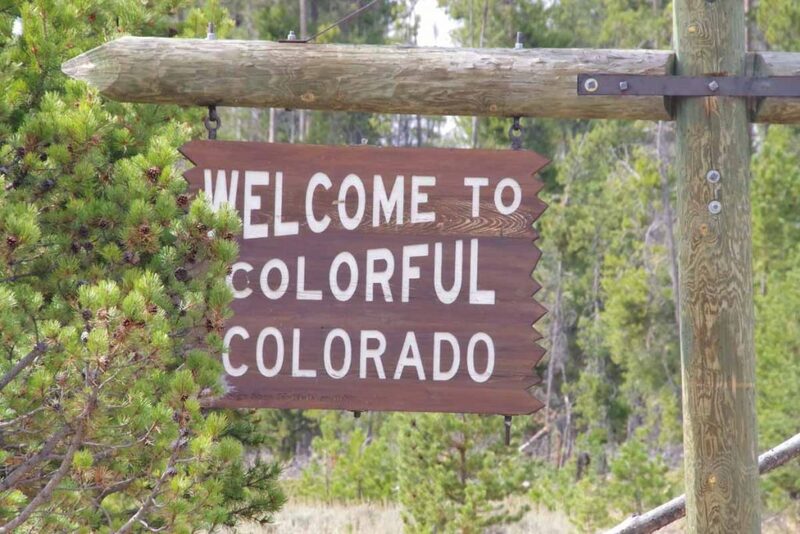 However, shortly thereafter I came to the Welcome to Colorful Colorado sign. It was 9 miles of both headwind and mostly downhill from here to the next road junction. This brought me to North Park, a large treeless and relatively flat area. Walden is in the middle of this space. Cowdrey is first. 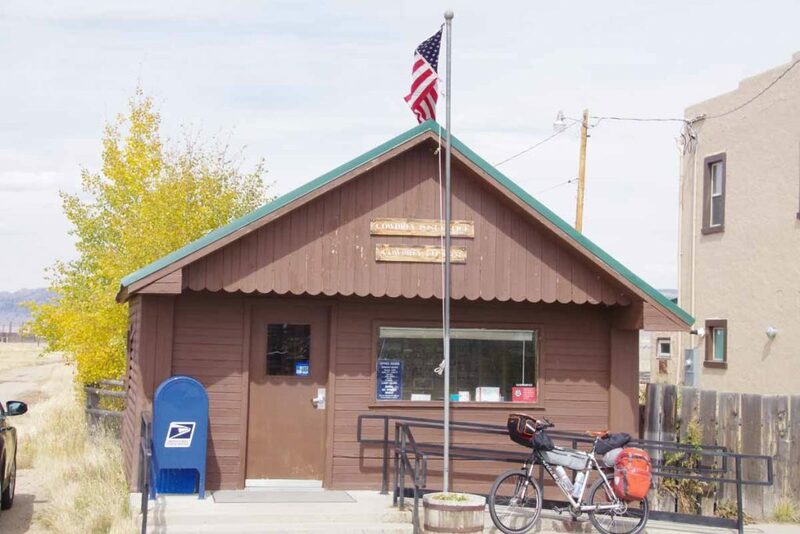 Above is the small post office. There isn’t much else in Cowdrey. At end of 63 miles I was in to Walden. 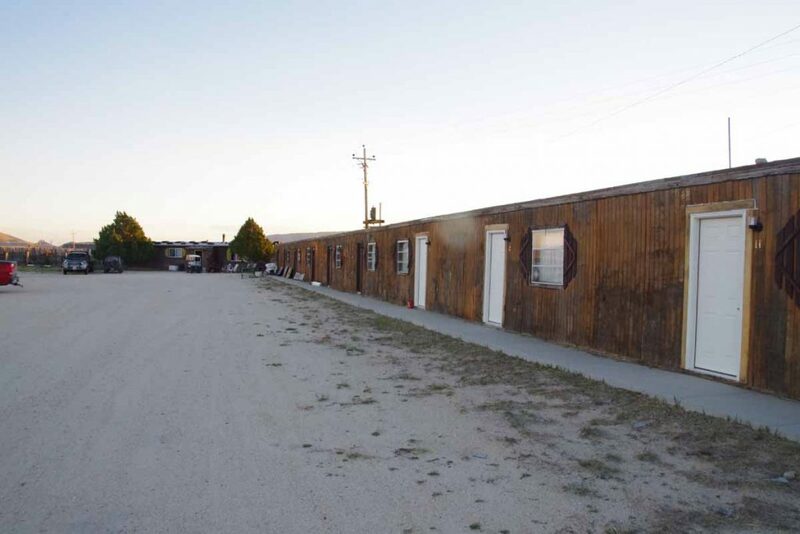 There are five motels in town and none have vacancies. Apparently, a combination of firefighters, hunters and other workers have made this very popular. 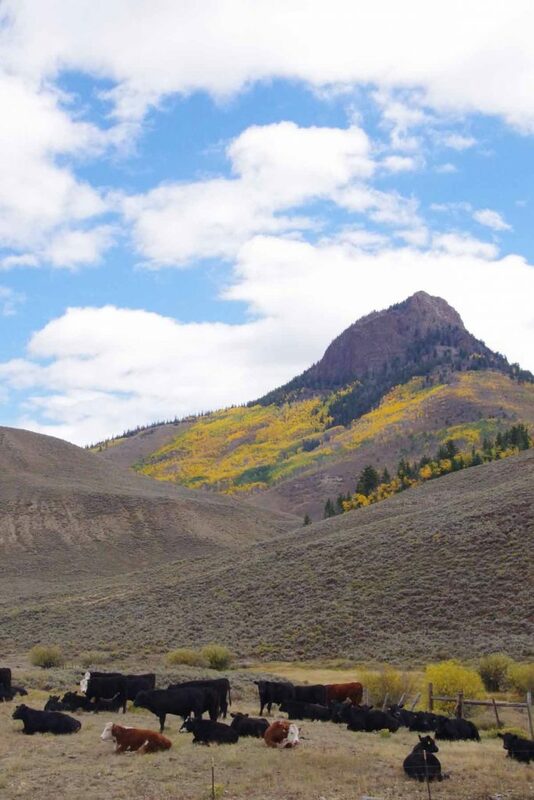 It is currently bear and elk season with the latter being bow hunting only. I’m told it will get even busier once the elk season opens for rifles. 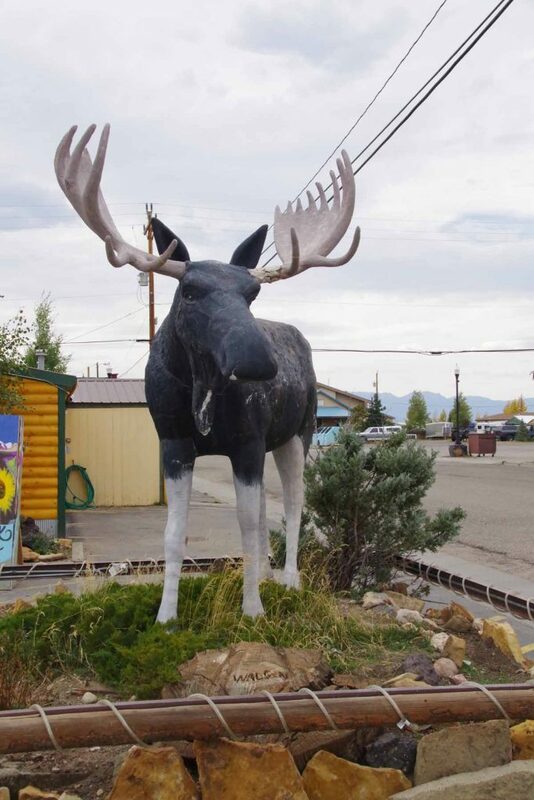 Otherwise Walden dubs itself as the “Moose watching capital of Colorado”. I wandered through familiar haunts before camping in the city park. Warm overnight and the sprinklers didn’t come on. Today definitely had some riding into the wind as it was blowing even at the start. The first 34 miles started in flat open North Park. 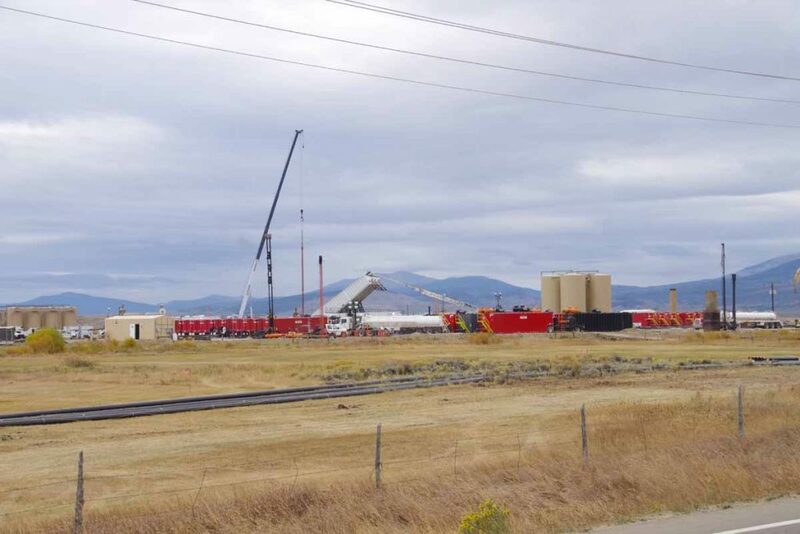 There was some energy development going on at several sites. Shoulders on the road were narrow and there was some truck traffic, but all well behaved. After ~22 miles the road slowly found a valley and followed gradually up to the pass. Definitely have a lot of fall colors. Not far from the top, one can spot the Rabbit Ears. 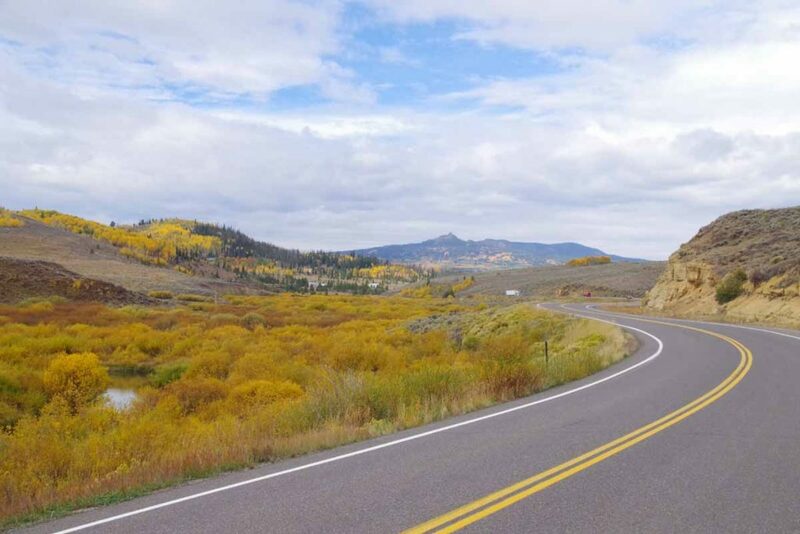 I wasn’t going up all the way to Rabbit Ears Pass, but instead just over a 8772 ft continental divide crossing named Muddy Creek Pass. 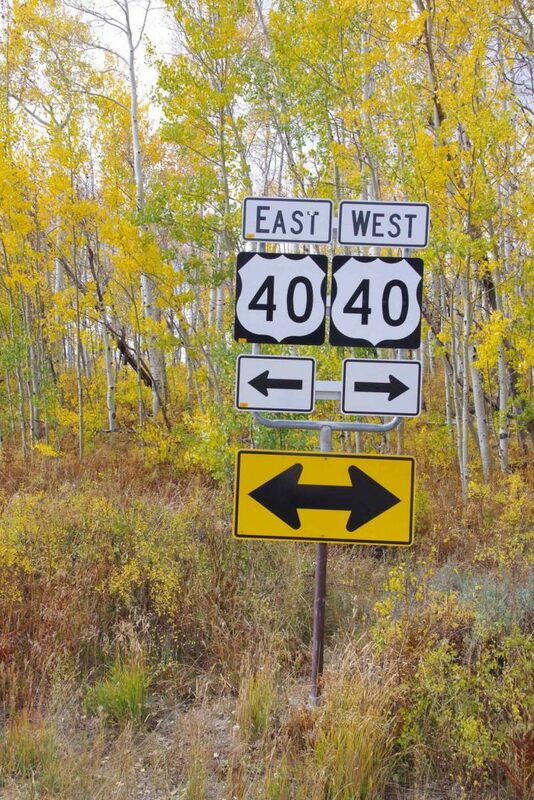 There wasn’t even a sign, so took this photo of the Highway 40 Junction instead. From this point, it was ~1300ft of descent over 27 miles down to Kremmling. Here I definitely noticed some of the wind coming from the south. Nice view coming towards Kremmling. 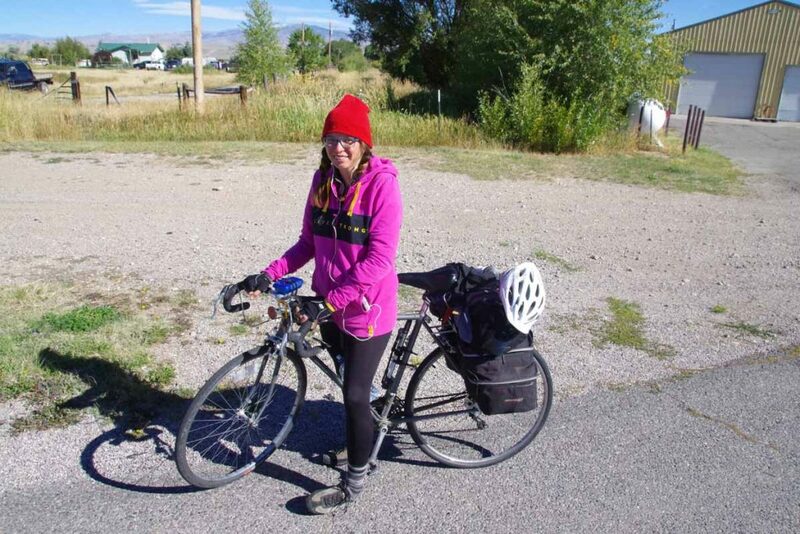 Within Kremmling, met this cross-country cyclist headed west. 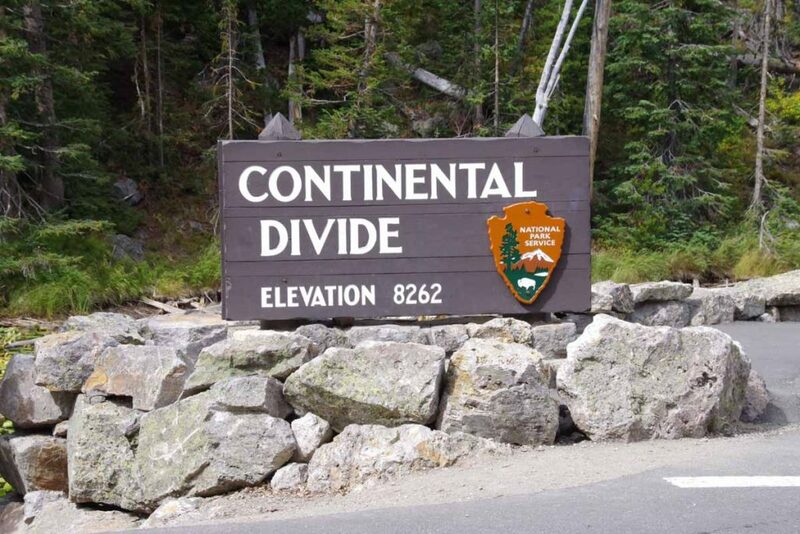 Also met four Great Divide Mountain bike riders on their way south. No photo because I was walking around town without my camera. They had started roughly the same time as myself in Banff and were making good progress. Overall, nice to be riding on the cleaned and fixed hub again. The past two days were good riding made a little more difficult with headwinds but also over familiar routes. I picked up my bicycle from Lee’s Cyclery in Fort Collins. Diagnosis on the hub was nothing broken, but instead the hub had gotten fowled and oil was dirty and hence the pawls were sticking shut. A good cleaning and light lube and it should be ready to go again. Otherwise, renewed both the chain and cassette which were worn. 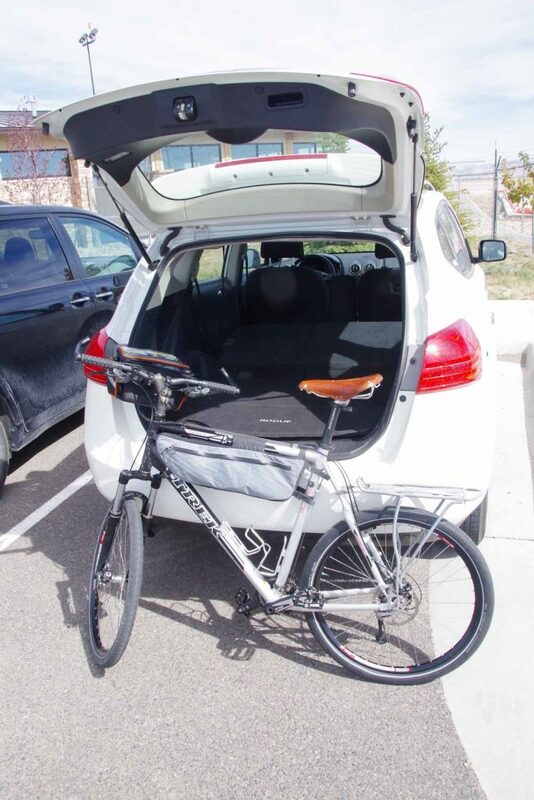 The bike rode well on the four miles from airport. Will see how things go from here. In addition, I’m also looking at a possible different hub (DT Swiss) that will be more easy for me to open and clean on the road. 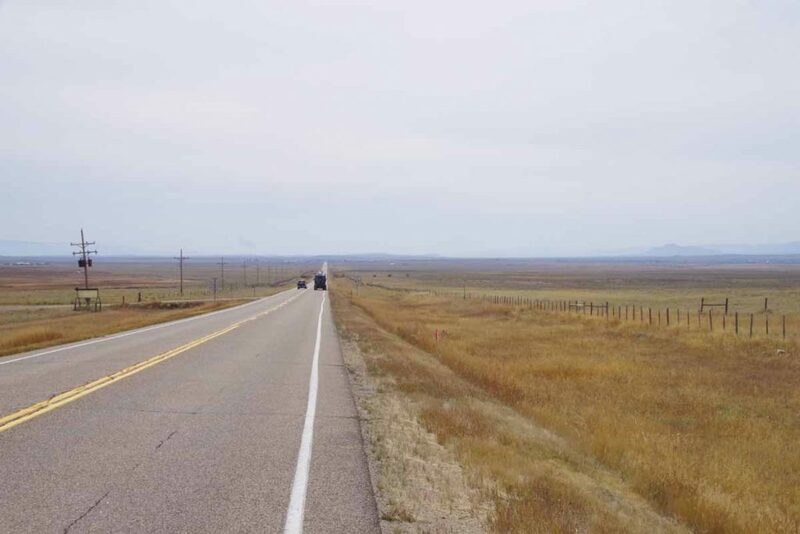 Plan is to depart from here tomorrow headed towards Walden, CO. Still looking at exactly where on the Mexico/US border I will head towards: El Paso or San Diego or somewhere in between. Today was example of how cycle touring doesn’t always go to plan, particularly with mechanical issues. 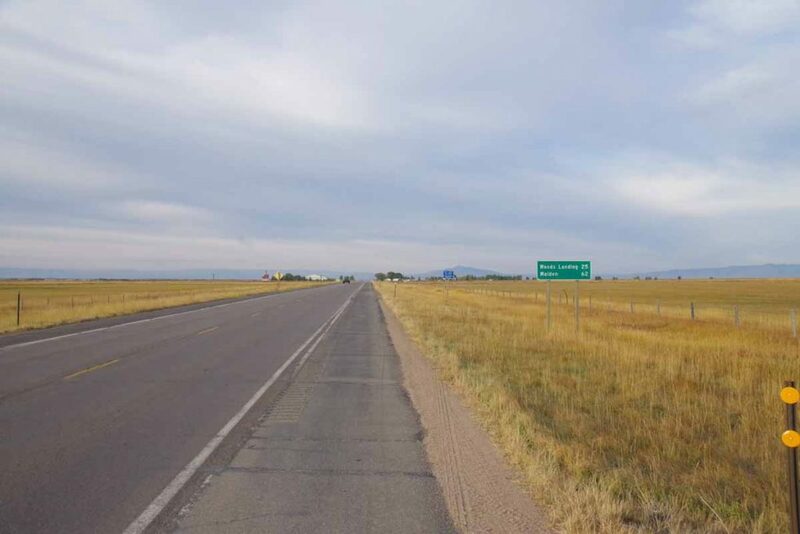 I had a simple plan worked out: (1) spend two days cycling ~120 miles from Rawlins to Laramie via Medicine Bow (2) rent a car for weekend to drive to Colorado and do the Pedal the Plains ride, visit family and get the bike serviced. I had another hub go out on me today. 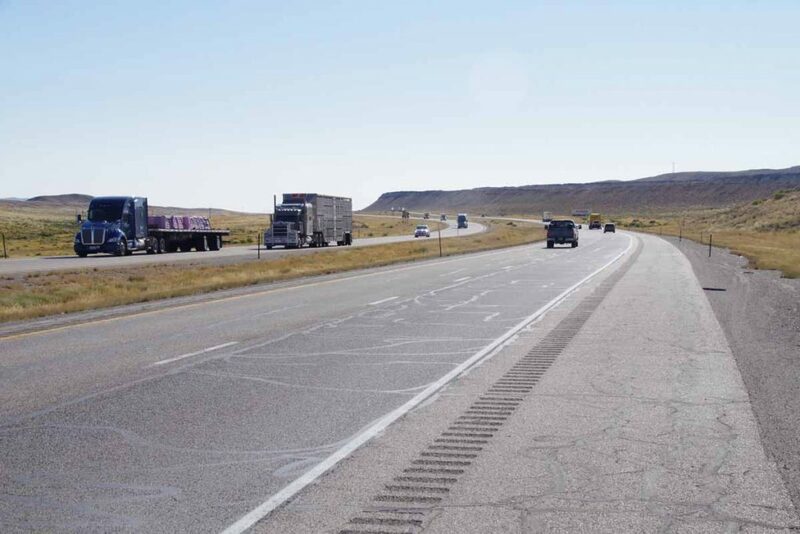 Actually, I’ll still be able to do the other parts of the plans since I got a ride into Medicine Bow, a hotel room and a ride tomorrow morning to Laramie – but also need to sort through these hub issues. Today started out normal enough. 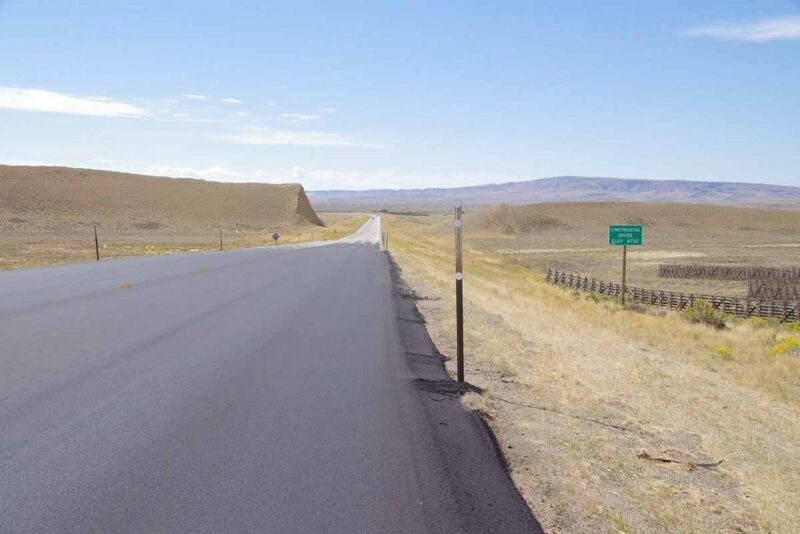 Rawlins is on a major transportation corridor with trail lines as well as I-80. Forecast called for headwinds early and decreasing through the day. First seven miles went on back road via Sinclair. 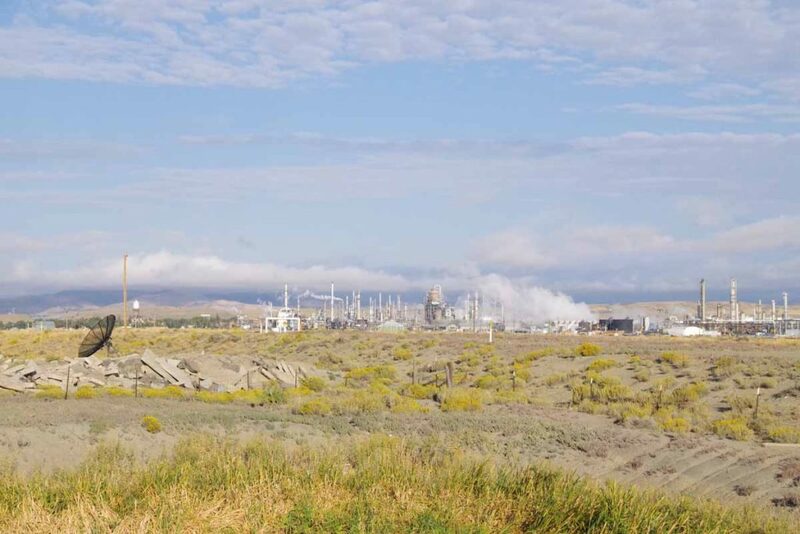 Sinclair is a very small town with a large oil refinery. They were rebuilding the main street but I was able to get along other roads. I stopped in at the truck stop before getting on I-80. 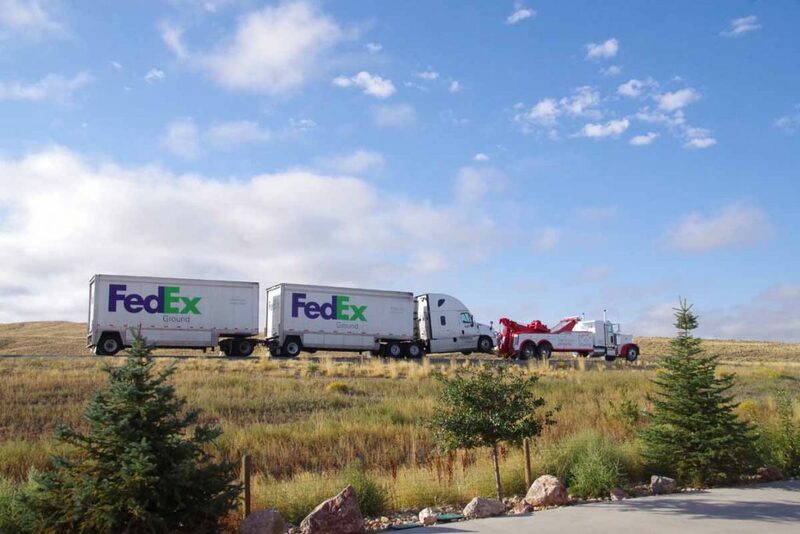 This Fed-Ex truck had broken down and was getting a tow. Next 14 miles were on the interstate. There was a broad shoulder and cycling was easy. The last few miles before my exit, there was road construction that routed both directions onto our half of the interstate. Fortunately, I was on the half with the wide shoulder as other direction would have been tougher. At 21 miles was a shell station and much quieter roads. One or two miles were flatter and then good hill to climb. I was nearly at the top when had a louder clang. Somewhat surprisingly, then noticed that the hub was spinning freely both directions. The end failure was same as my earlier hub (spinning freely both ways) but symptoms before that were much different: on the previous hub it had been occasionally slipping for a while. This failure was much more sudden (haven’t opened things up but wondering if previous one was more pawls getting gunked up and this one was a spring breaking? – in any case more unexpected today. 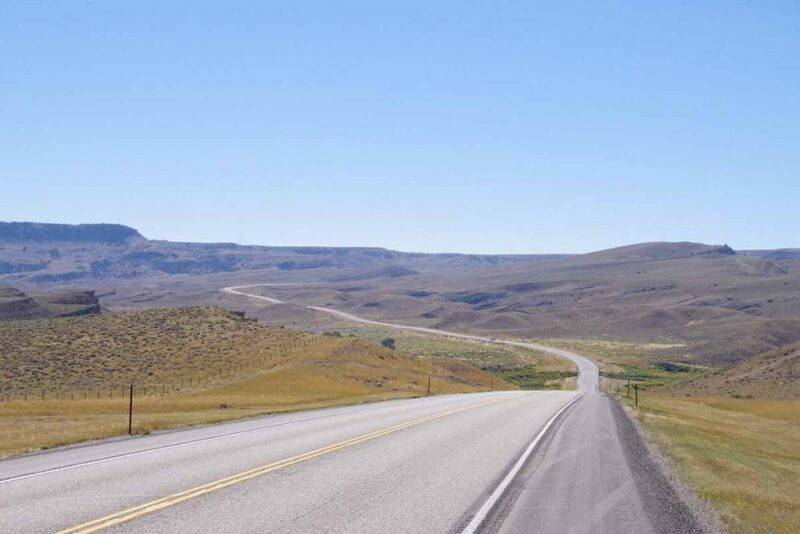 While there isn’t much traffic on a road like this, there was a higher percentage of pickup trucks. It didn’t take long and I was able to flag one down. 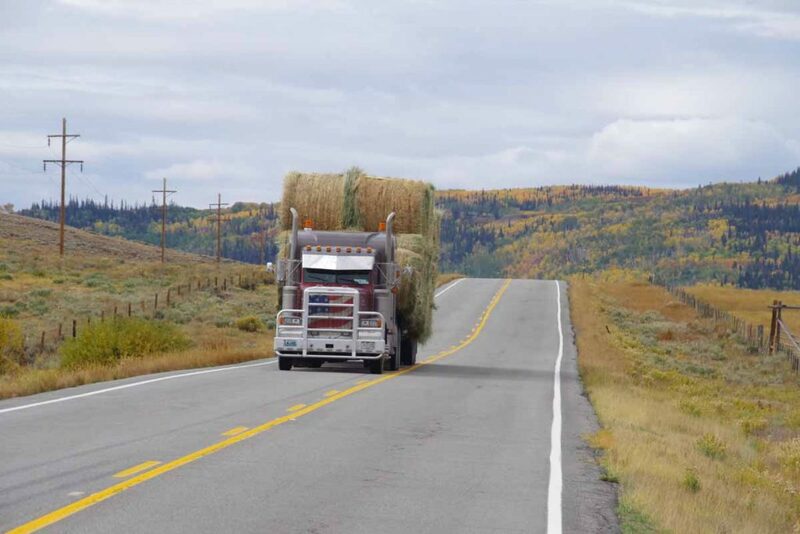 Kind folks who lived in Medicine Bow were driving there and gave me a lift the remaining 30 miles to the Virginian hotel in town. Here I had lunch as well as asked if anyone was going to Laramie today or tomorrow. I’ve arranged for a lift from one of the employees tomorrow morning. Plan is that I’ll go pick up the rental car I have reserved and then pick up the bike to bring it for service. 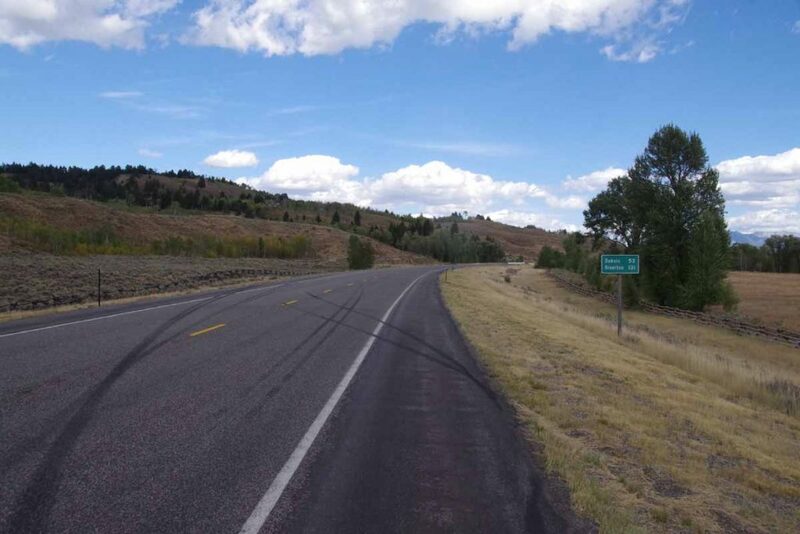 So I’m in Medicine Bow (as I planned), going to Laramie (as I planned), picking up a car (as I planned) and bringing the bike in to service (as I planned). However, rather unexpected was having the hub go on that hill earlier today. A google search of “phil woods hub failure” says I’m not the only one to have seen this issue – but will need to investigate a bit more before going to Latin America if there is a better alternative that can be more reliable. Two days cycling brought me from Lander to Rawlins. 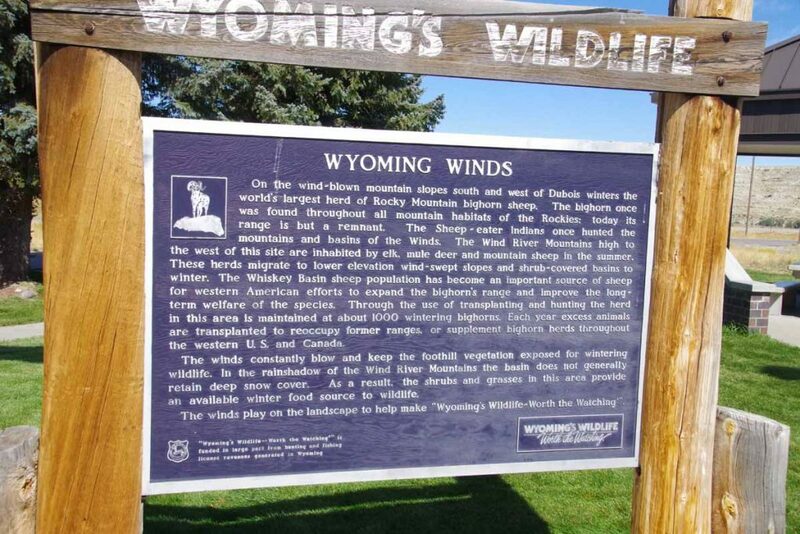 Wyoming is often windy and on second day we had a front come through the might have increased that wind. My description for the first day was “26-6-26”. This meant 26 miles of gently rolling hills, followed by a 6 mile climb, followed by 26 miles of mostly flat. Riding started out well, here is an example of one of those rolling hills. 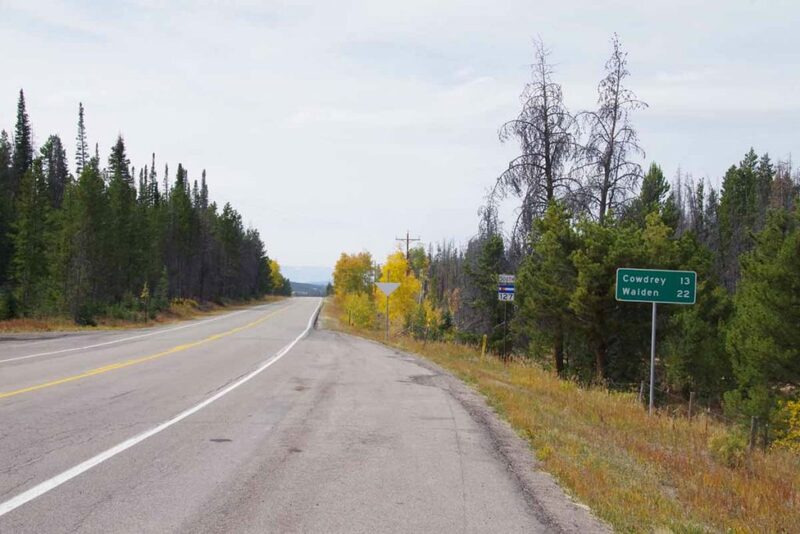 After 26 miles, I came to the base of the “Beaver Divide”. This was a steady climb that gained ~1100ft. By now, the wind was starting to pick up and during the climb there was some cross-wind as well as small bits of head wind. However, without too much trouble I slowly made my way to the top. Along with the view from the top. Tough to see in the distance, but believe Togwotee Pass is off there in the distance. By now the wind had definitely picked up and it was mostly a tailwind. Six at 38 miles was a rest area. I ate my lunch items inside out of the wind. While I didn’t stop in (it was Sunday), there was also the Mormon Handcart historic site nearby. 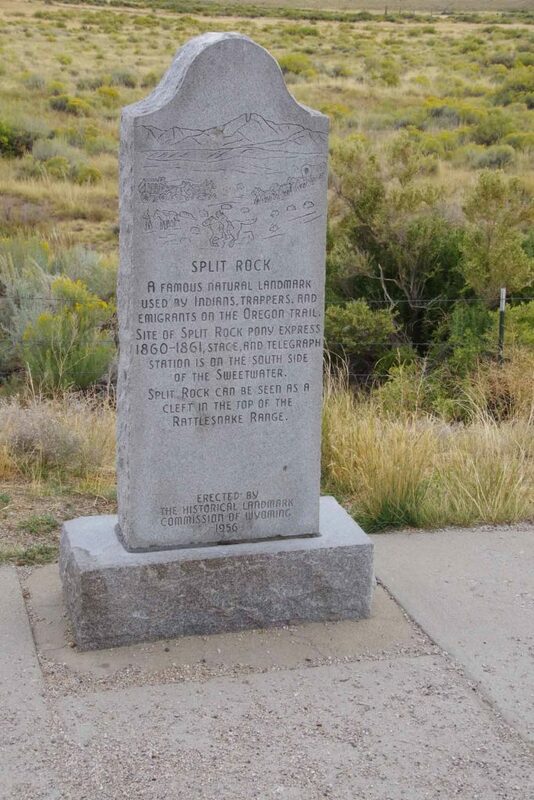 From what I’ve read, (wikipedia), some of the Mormon pioneers made the journey to Utah pulling handcarts. At this location, two handcart companies encountered early snows and a number of people perished. Just cycling this route on smooth pavement, one definitely gets a sense of how difficult it must have been to have walked through this area pulling a cart. The last 20 miles were open riding with a good tailwind. 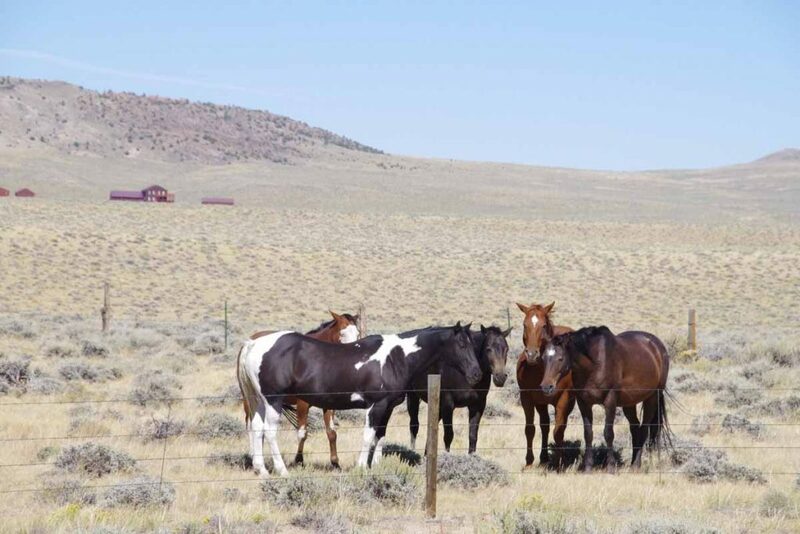 The horses seem to congregate when there is wind. This brought me to Jeffrey City. 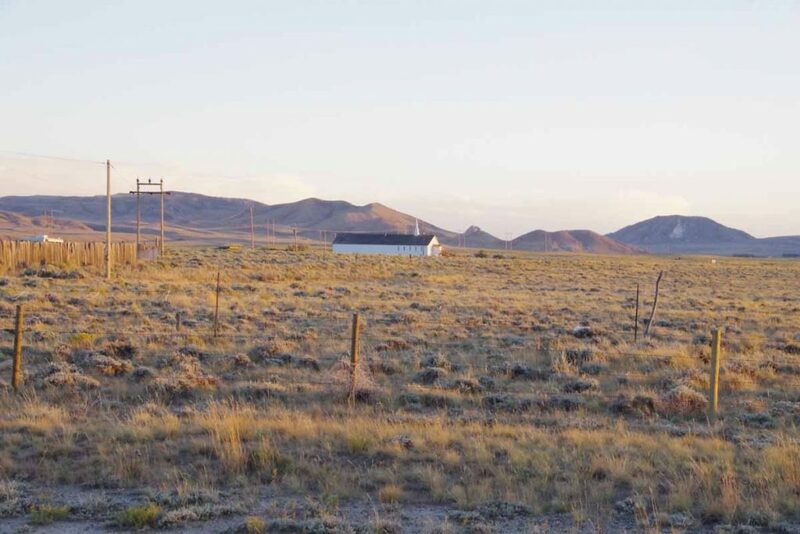 Jeffrey City had once been a booming uranium mining town with several thousand people. About 95% of the people left and one can see some abandoned buildings from the road. The Split Rock Cafe and Bar seems to be a center of what is left. I stopped in for a late lunch. This community also has reputation of being very welcoming to cyclists. Sign above pointed to the Community Church a little ways away. Both the church and the pottery building will let cyclists camp. Later in the evening I talked with the pottery dude. He had bought an old gas station some years ago for $5000 and now makes and sells pottery. 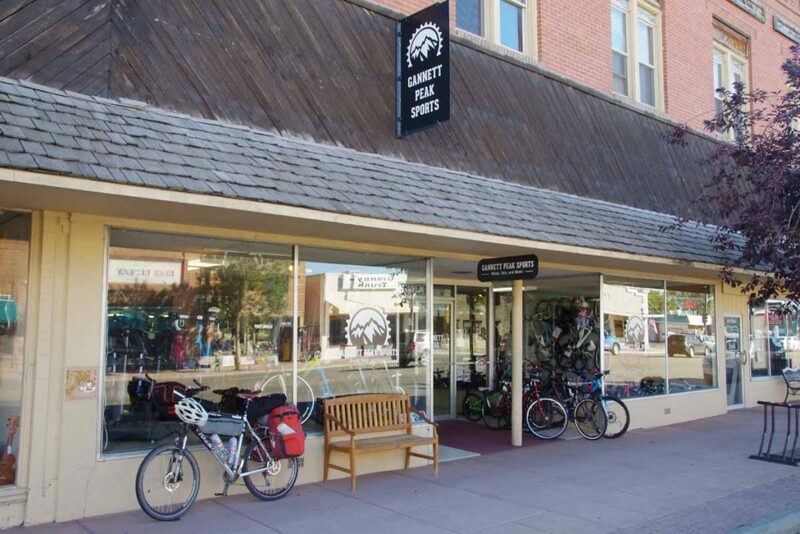 He realizes he won’t see much pottery to cyclists, but still gives them cookies and has a spot on the Adventure Cycling maps offering behind his store as camping place. 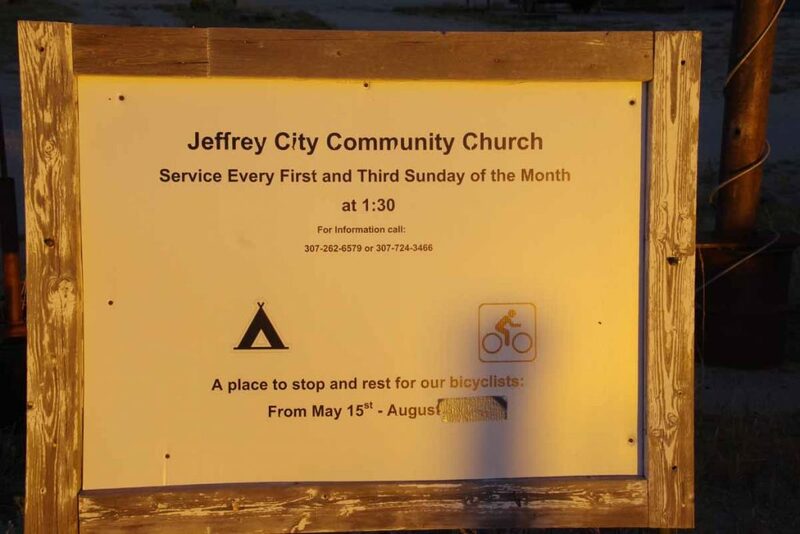 He also pointed out to me that Jeffrey City had won a June Curry award from Adventure Cycling for being such a welcoming community after the local motel had shut down. While the motel has reopened (and I stayed there), I definitely got a sense of welcome hanging out in the Split Rock cafe and talking with folks. The wind howled through the night as the front passed through. I knew it was shifting from SW (tailwind) to NE (headwind for 1st 23 miles) so somewhat concerned of how difficult the day might become. Fortunately, by 7am the wind had lessened. I had a breakfast at the Split Rock cafe and then set out into the wind. It was much colder and there were some drops of rain. This made for slow steady slog. After 15 miles I came past Split Rock. After 23 miles, I came to the Muddy Gap junction. The temperature had dropped to ~3C (37F) and last bits had some head wind. Fortunately, it warmed up significantly from here and the road also changed to have more tail wind as I went through muddy gap. 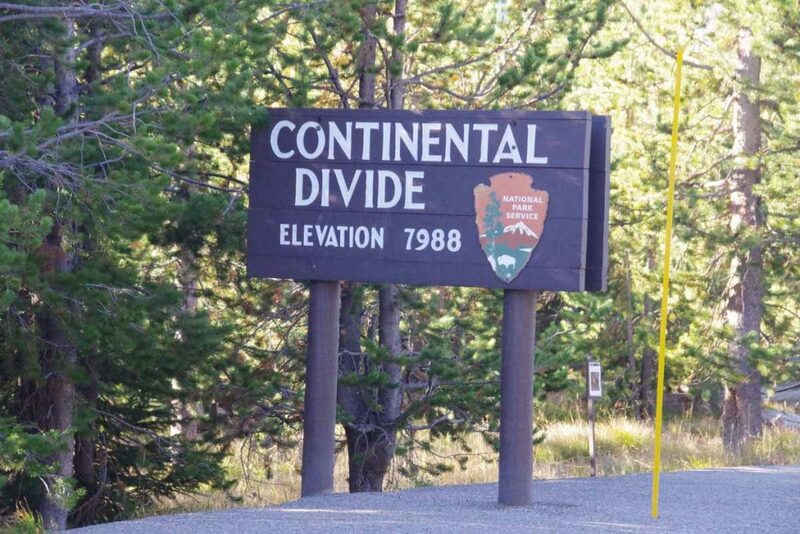 I crossed the continental divide to a region known as “Great Divide Basin”. 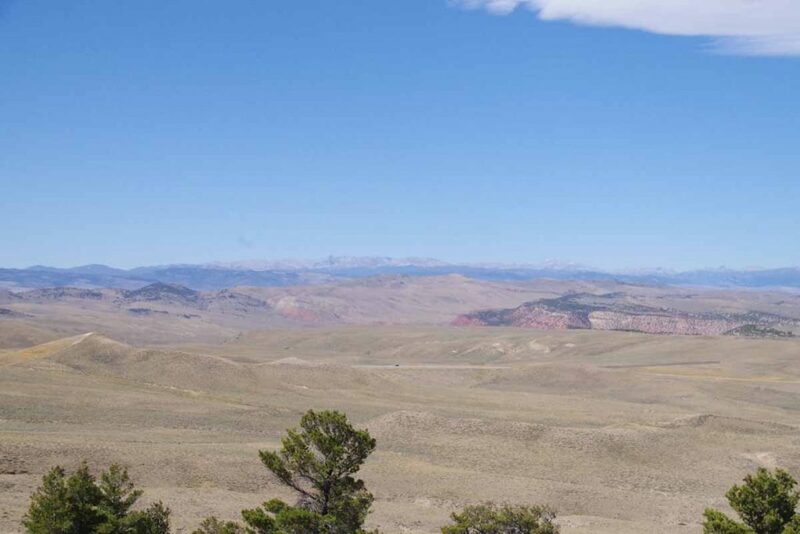 There isn’t much precipitation or water in this basin and the water that is there evaporates rather than going to either Atlantic or Pacific. 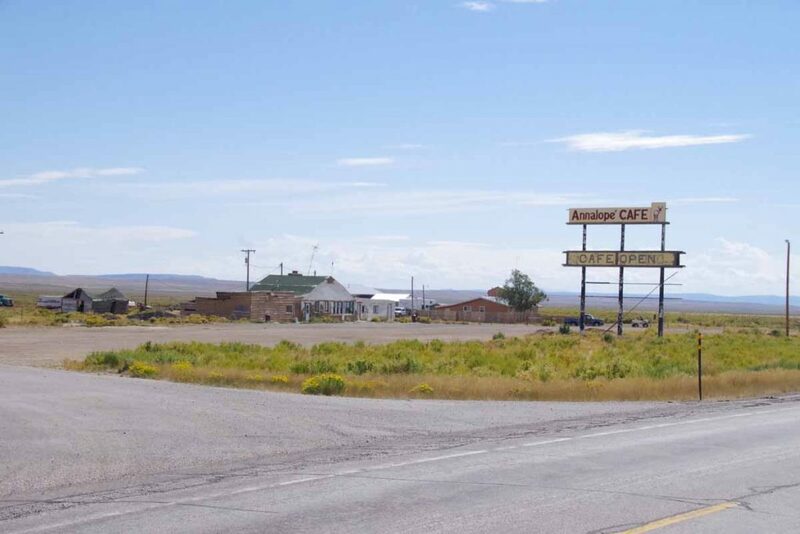 Despite the sign, the Anna-lope cafe in Lamont was not open. 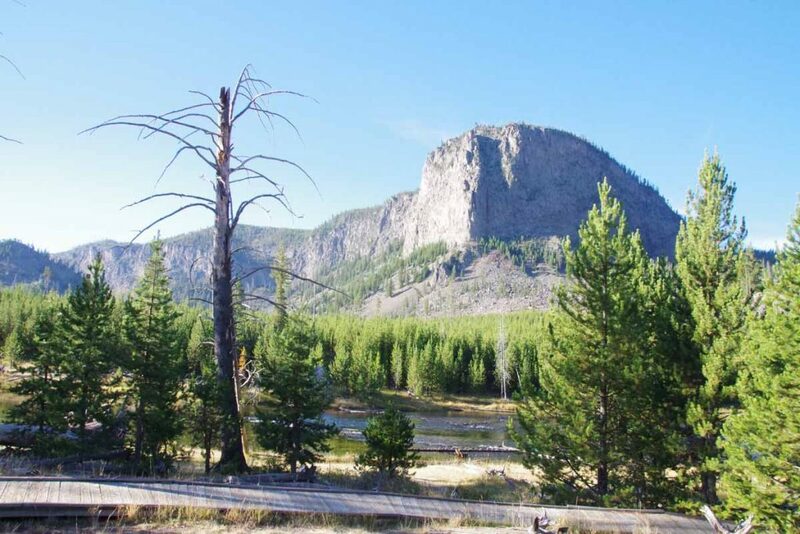 I have been following the “Transamerica Trail” which goes from Virginia to Oregon. 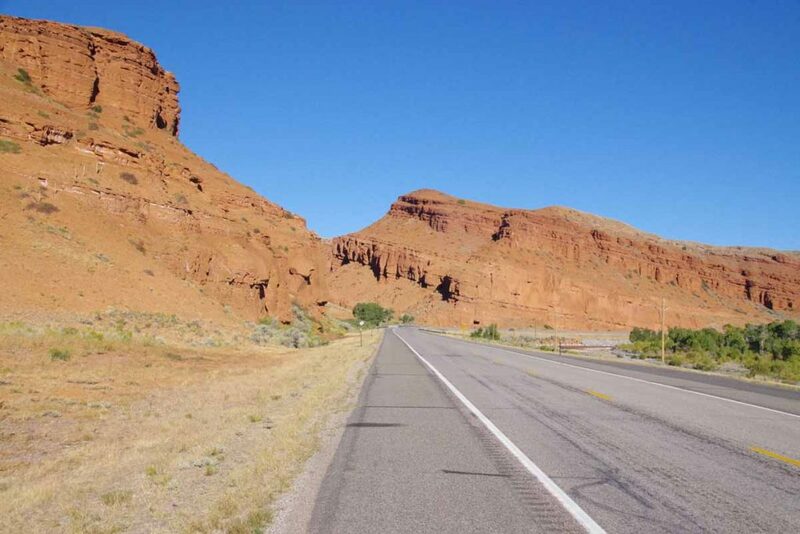 However, the Great Divide Mountain bike route also rejoined here for last 15 miles into Rawlins. 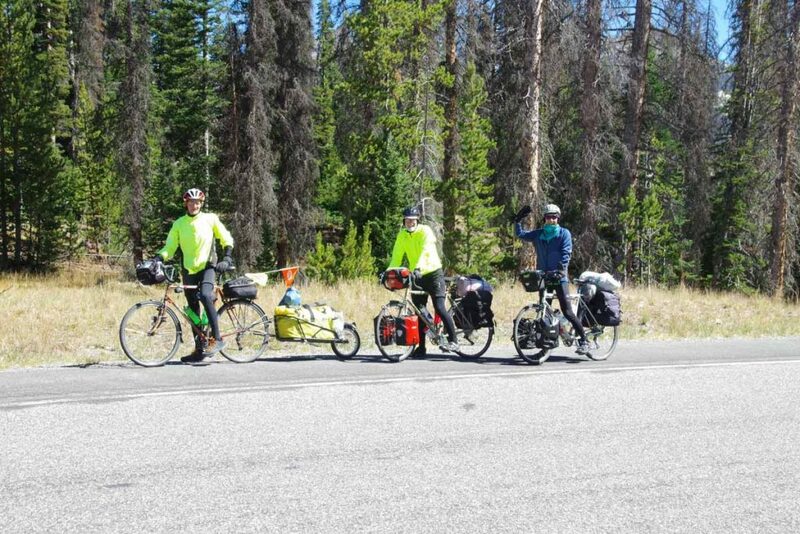 These cyclists had started August 8th in Banff and were doing the Great Divide. 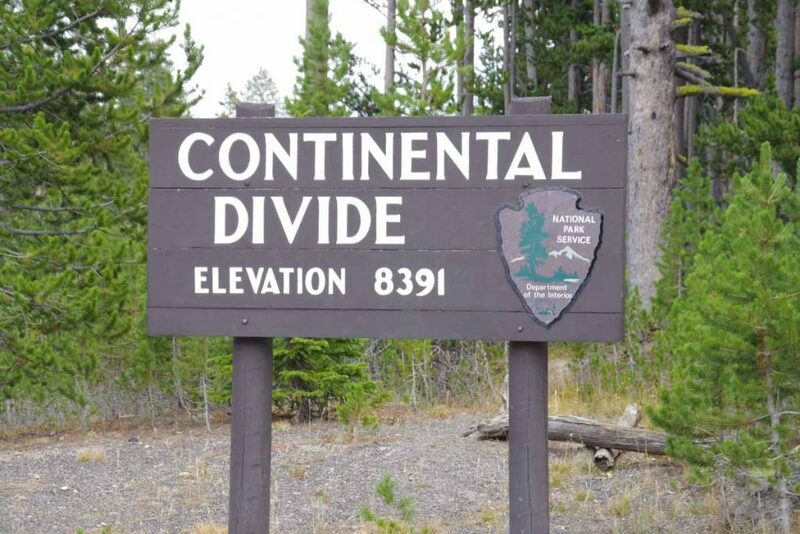 Not much later, I crossed the continental divide and left the Great Divide basin. The last miles into Rawlins were fast as they were downhill and down wind. Yeah! 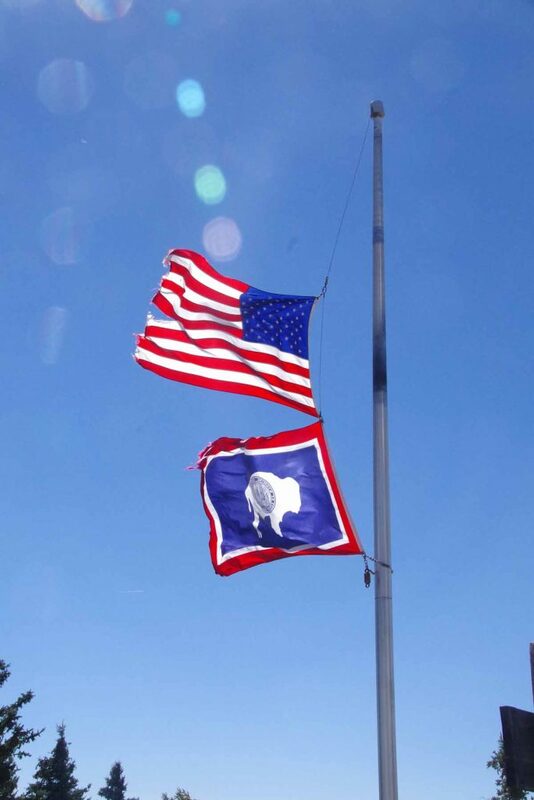 Overall definitely had some strong winds the past two days and also good sense of hospitality at Jeffrey City. Higher than average miles today (75 miles) but still an easy day as winds and elevation drop were favorable. Today was a day with 45F (25C) temperature swing. Morning was cold 34F but mid-afternoon was over 80F. Flag flying above meant I started out with tailwinds! While they didn’t last much beyond the first 20 miles, the wind and elevation drop made for a fast and easy start. 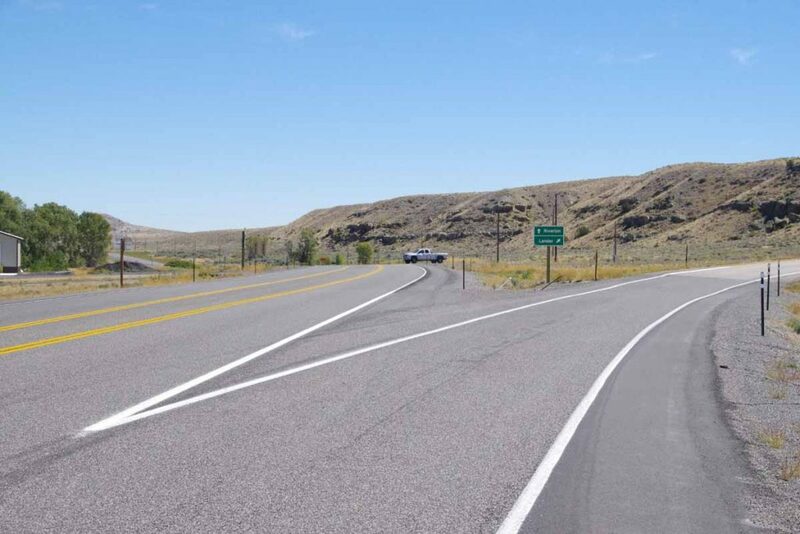 At 12 miles I crossed over onto Wind River Indian Reservation where I would ride for the next 58 miles. This sandstone was just a few miles after entering the reservation. Other than the entry/exit signs and a few shops, I didn’t necessarily notice that much different about this reservation. 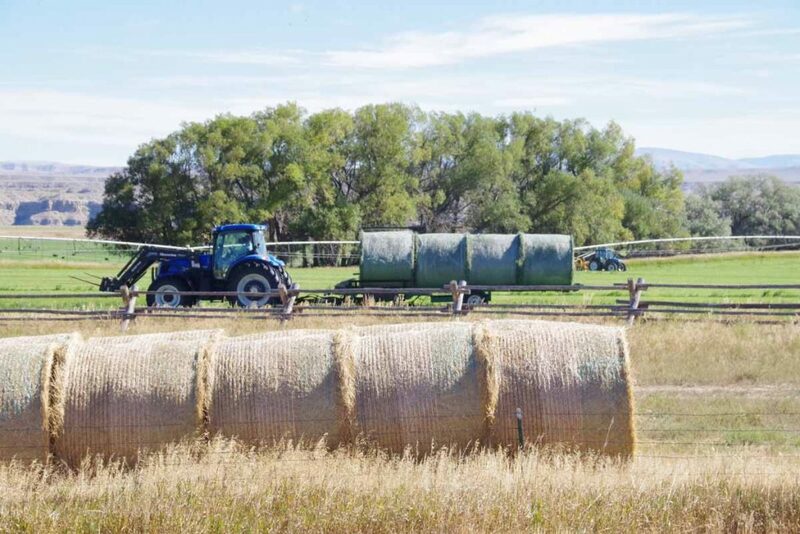 Parts of it were still agricultural and other parts were wide open lands or grazing land. At 25 miles was Burris which mostly seemed to consist of a house and a sign and 5 miles later some more ranches near Crowheart. 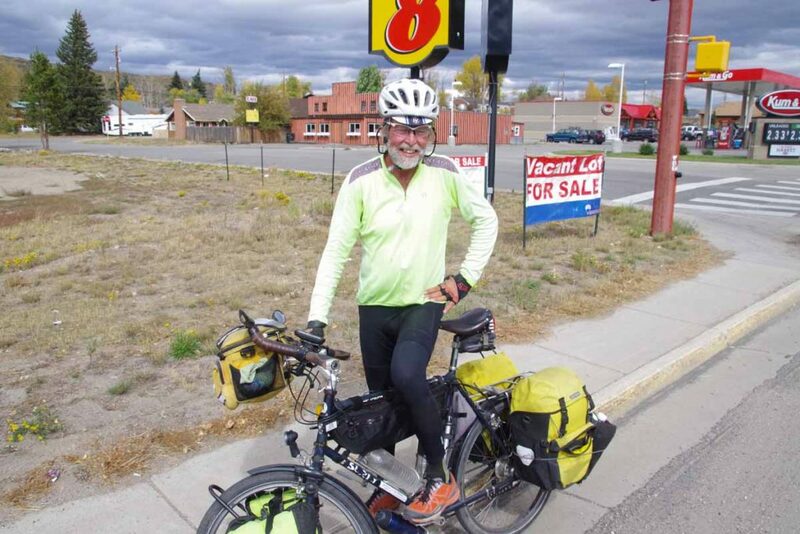 Met a cyclist who started in Tennessee, rode to New York City and was now heading west. We traded information about the road ahead. Also had a snack at the Crowheart store. By now the wind had shifted some, occasionally a cross-wind or even slight headwind but fortunately not very hard. There was a rest area at 41 miles that had this description of the wind. 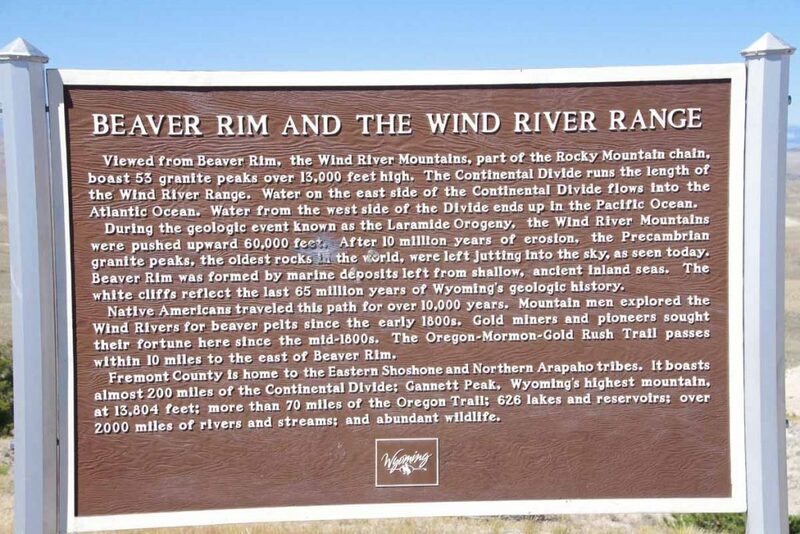 Mentioned on the sign are bighorn sheep. There is a bighorn sheep museum in Debois, but unfortunately their fall hours yesterday closed at 4pm and I just missed them. Three miles later, the road split. 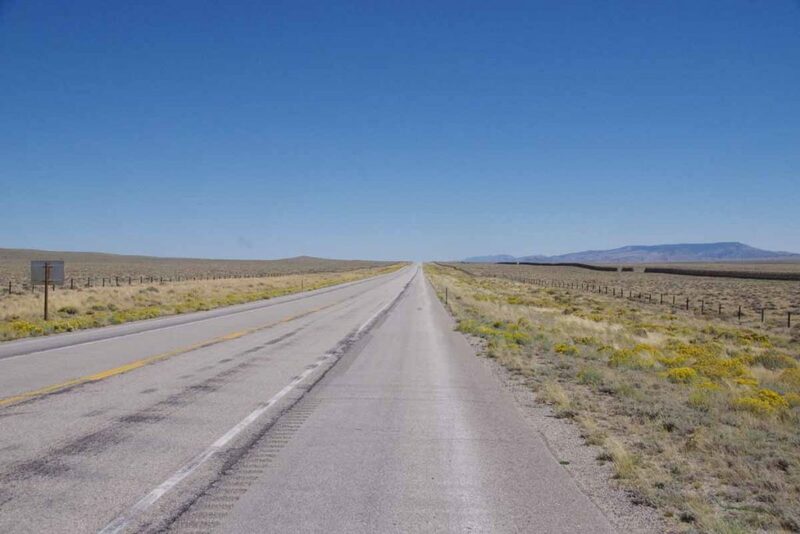 The next mile was a bit of a climb and then I was out in the wide open spaces. 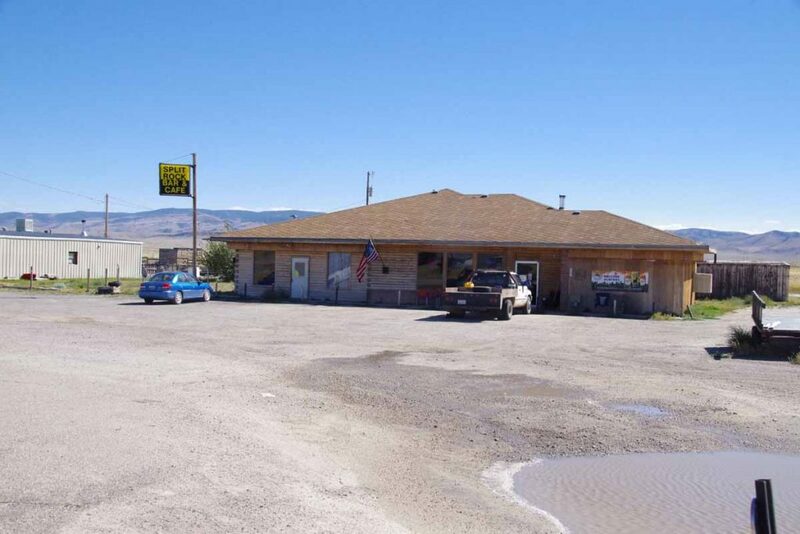 Fort Washakie seemed to be a bit more of a town and had another gas station convenience store to stop. By now the road thermometers were over 80F and also a bit more traffic on the road. Cycled the last 15 miles to Lander. Lander is a pretty big town: over 7000 residents and first traffic lights I’ve seen since entering Wyoming four days and 200+ miles ago. There is a large bike shop here, Gannett Peak Sports that gives an ice cream bar to touring cyclists (thanks!) and also had a log book that you could sign. Added my entry along with the others. They definitely get some traffic through here. Otherwise got out the maps and looked for next few days. 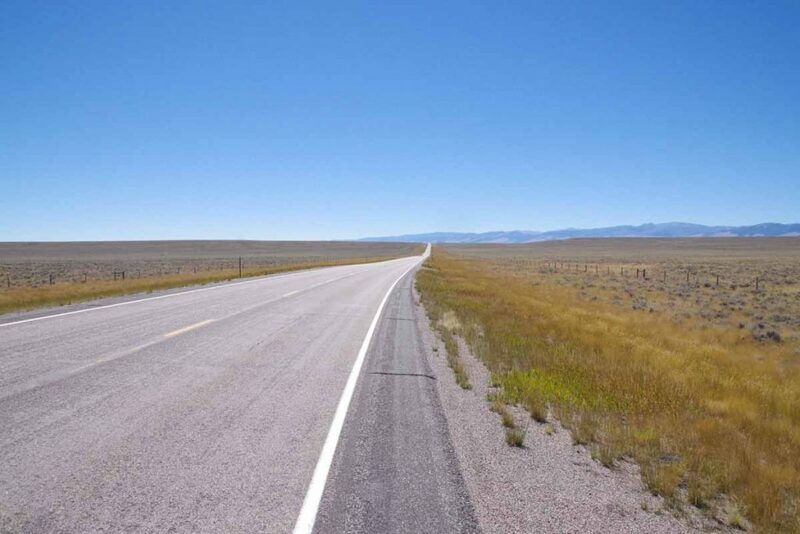 Approximately two days cycling to Rawlins and then some different choices. The objective today was simple: climb ~3000 feet up and over Togwotee Pass and descend the other side to Dubois. 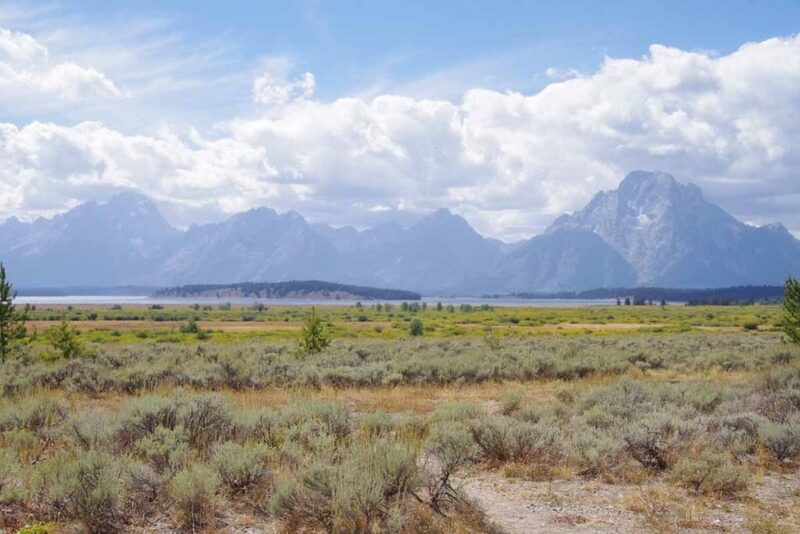 The Tetons were behind me and ~17.5 miles of climbing from Hatchet to the summit with the majority of this in the first half. I got into low gear and slowly went up the hill. 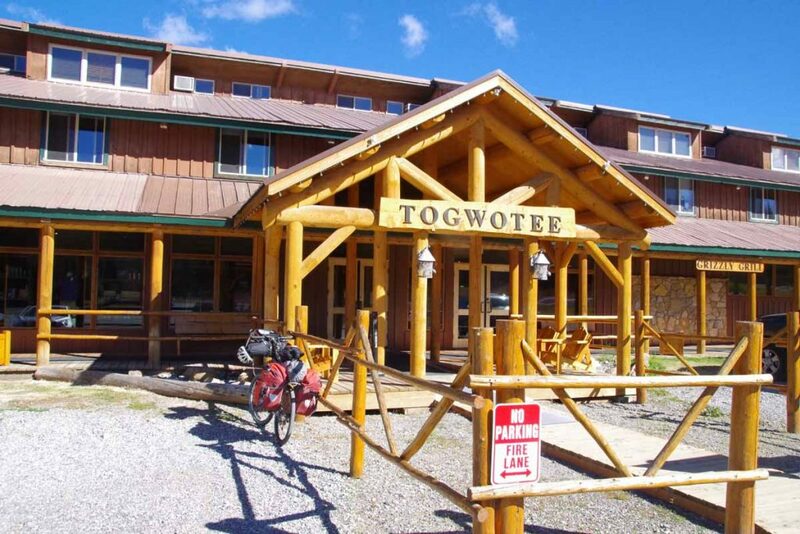 At 9 miles was Togwotee Lodge, an upscale place. I stopped in to buy a candy bar and take a short rest. After this the road was slightly flatter for a few miles and then some shorter steep climbs. While it wasn’t fast, I was happy to get to the summit and see the sign. Hooray! A slight tailwind had picked up which was also welcome. From here, the first nine miles had more of the descent and then more gradual after that. Above is a photo of some of the rock formations near the summit. As I descended I came past some burned areas. 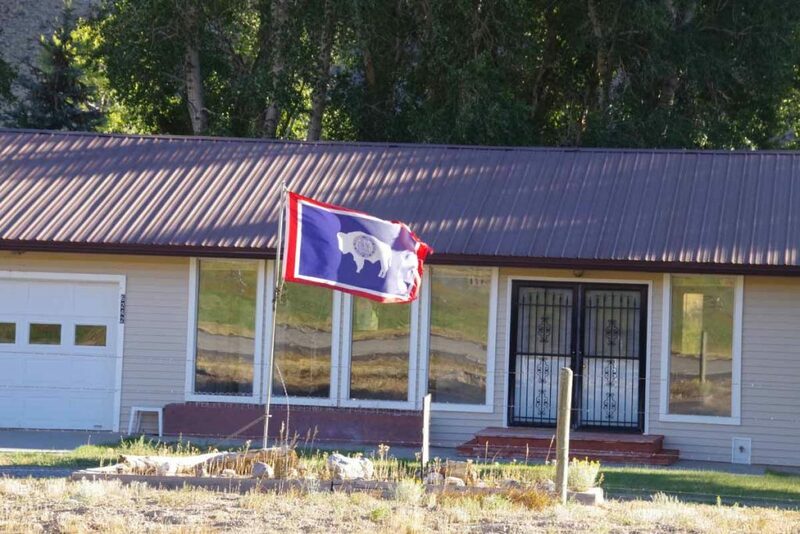 The Lava Mountain lodge had sign “tx firefighters” so assume the two were related. 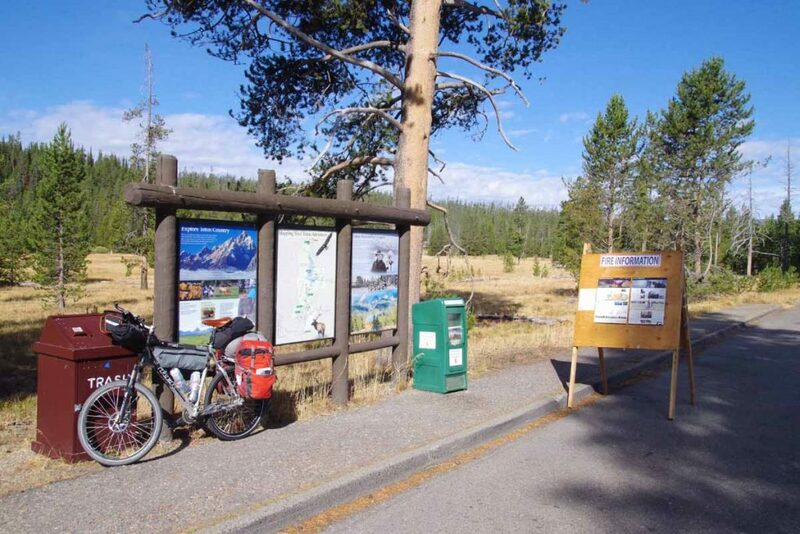 These three cyclists started July 17th from east coast and were following the Transamerica Trail to Oregon. 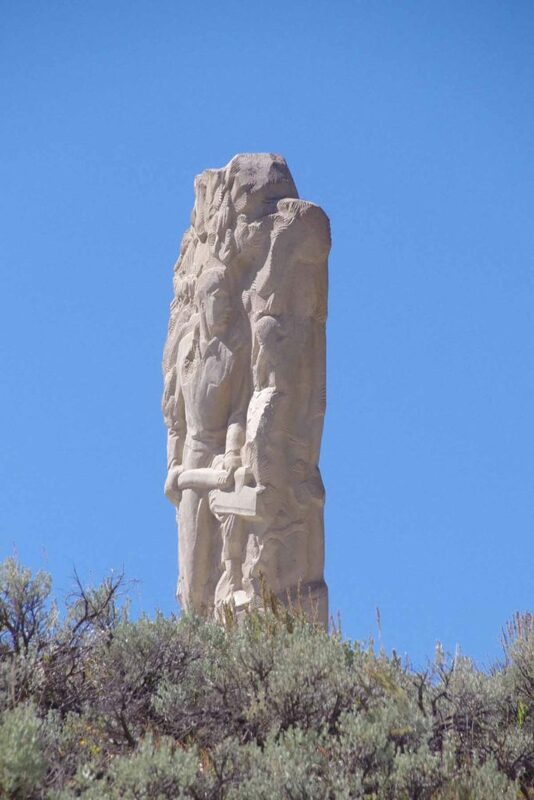 This monument was to “tie hacks”, in particular those whose particular skills were in hacking trees to create well-formed railroad ties. 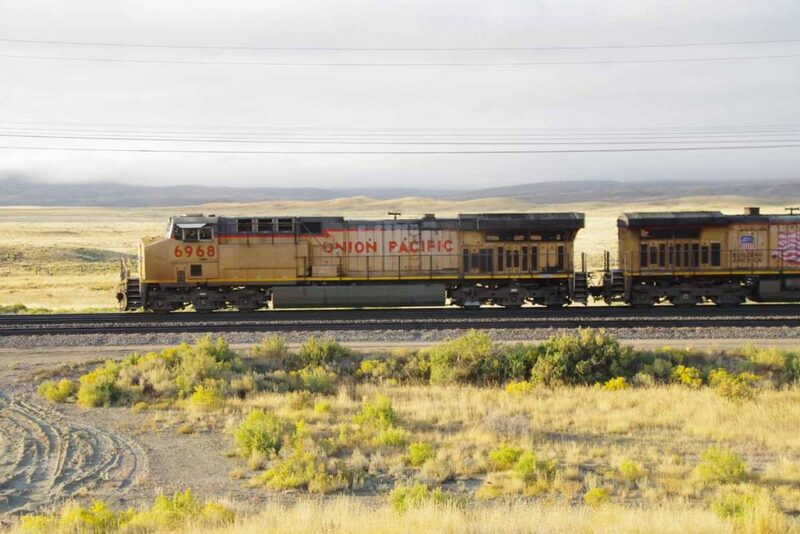 This eventually died off both as demand for railroad ties lessened and as sawmills were used instead. 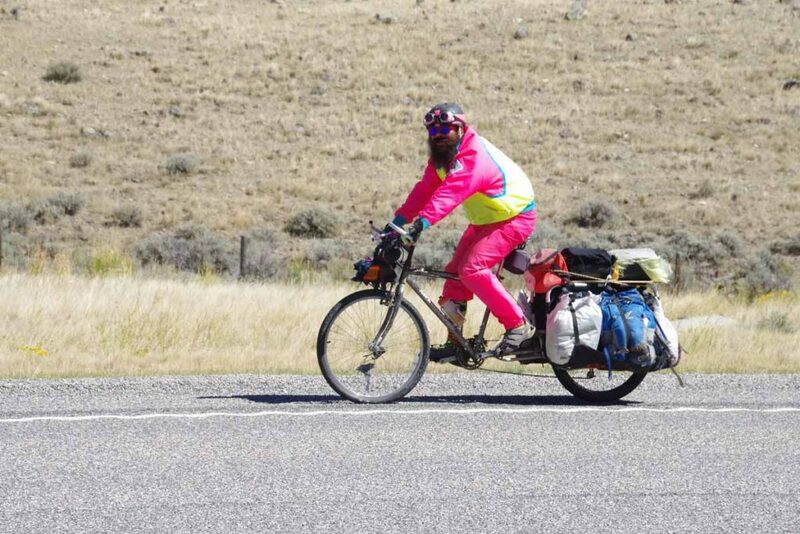 This cyclist had started in Vermont and was on his way to the west coast. Tailwinds and a slight descent made for good travels. 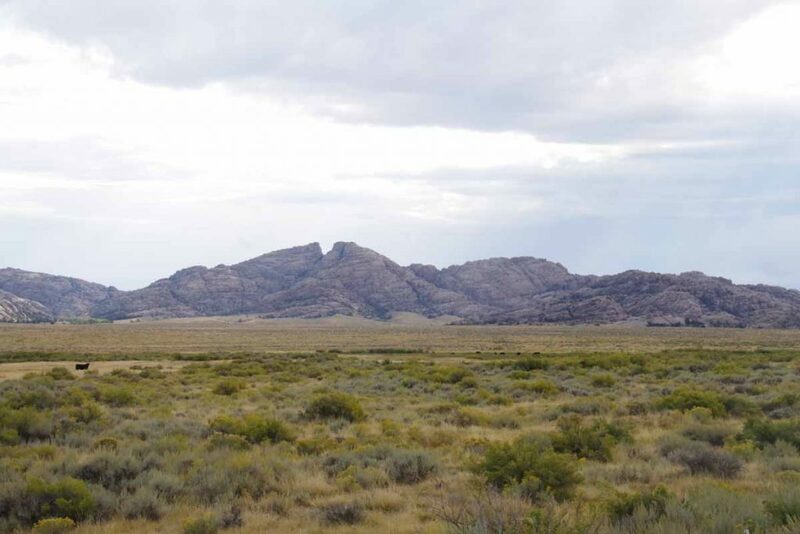 As I got nearer to Dubois (locals pronounce it as “dew-boys”) the rocks and landscapes also changed. 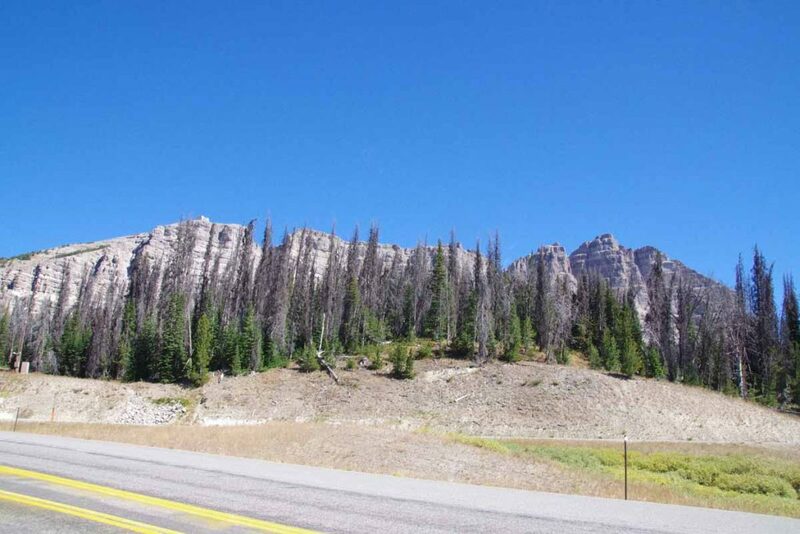 Looks a fair amount dryer than on the west side of the pass. Nice to reach Dubois and find place to stay. 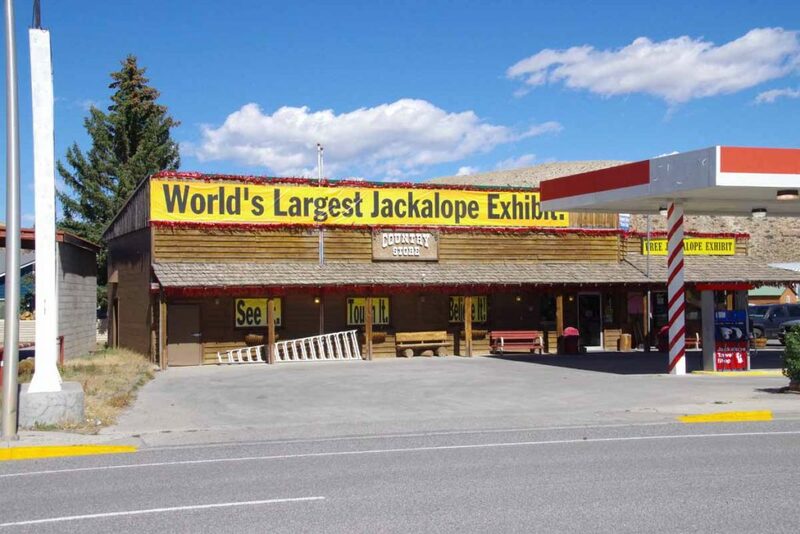 I did investigate this jackalope exhibit, but nothing particularly fancy here. 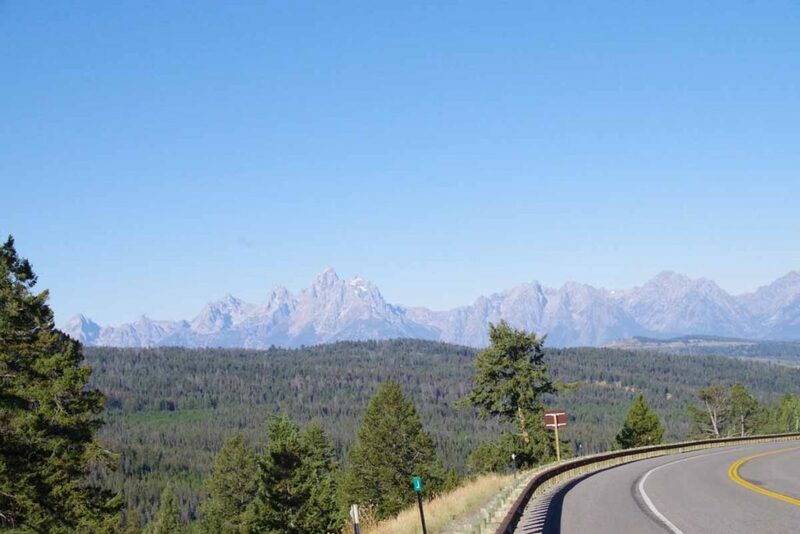 Two days of pretty cycling to catch a slice of Yellowstone and Grand Teton National Parks. 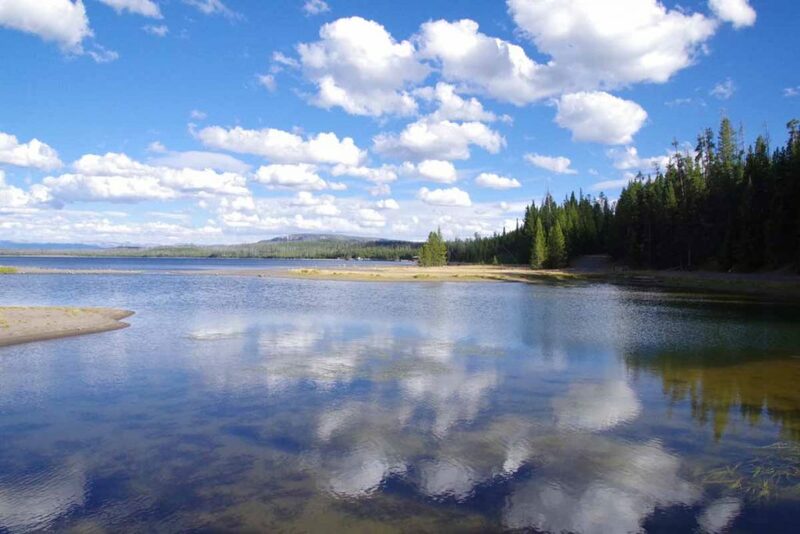 West Yellowstone is definitely a gateway community focused on guests to the National Parks. At 6:30am, a tour bus was busy filling up outside the motel. I walked over to the McDonalds for a breakfast and then packed to go. At 34F (1C), it was at least above freezing. Withing 0.5 miles I reached the entrance station and showed my pass. 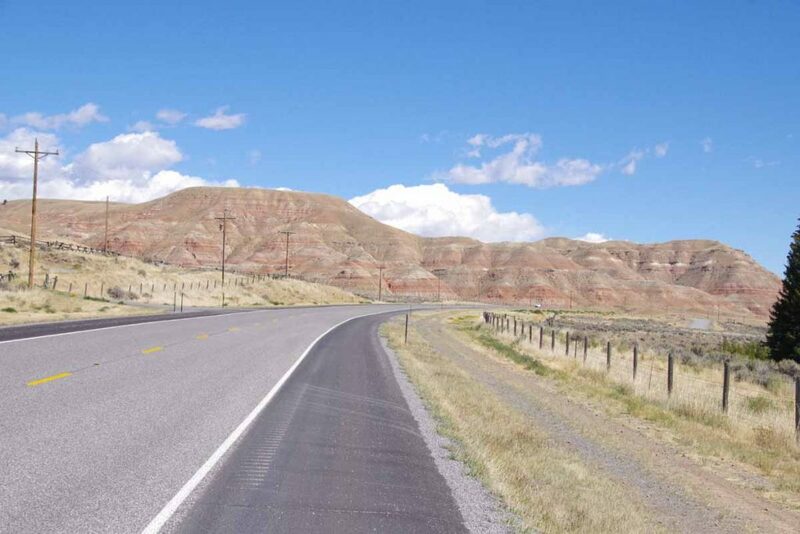 At 2.5 miles I crossed into Wyoming. 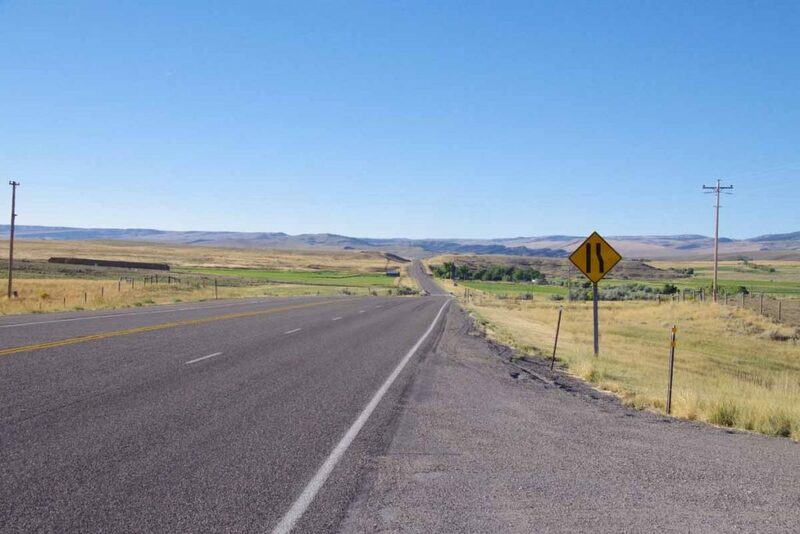 The first 14 miles were flat as the route followed the Madison River. 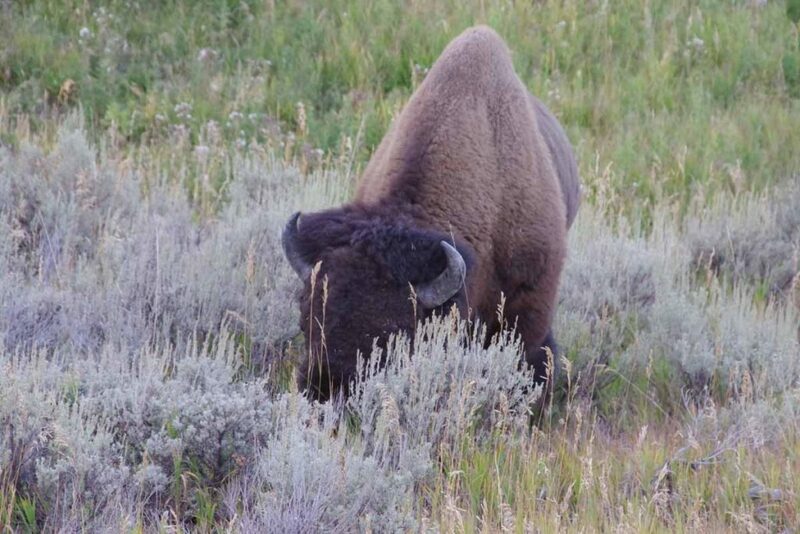 I saw a bison grazing over by side of the road. Otherwise some nice views. The shoulder was reasonable and while there was a fair amount of traffic, speeds were slow and gave me plenty of room. 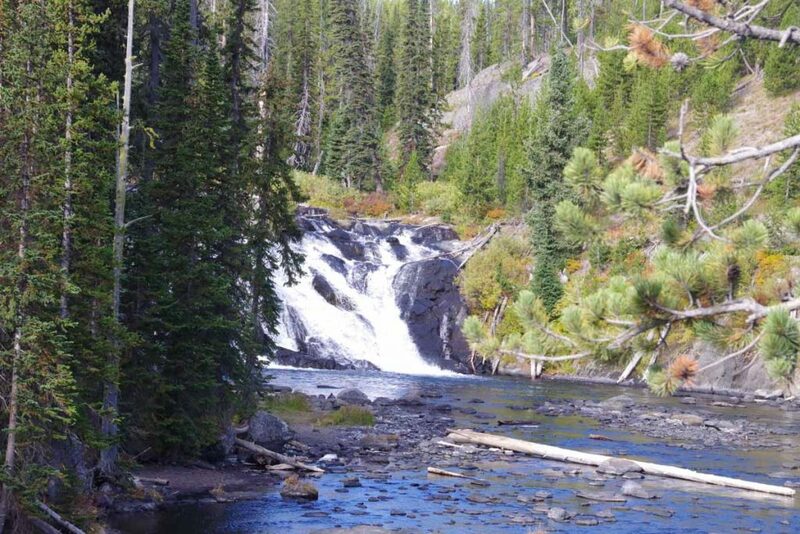 At 14 miles, I took the small side road up Firehole Canyon. There is a harder layer of basalt on top of softer layers. 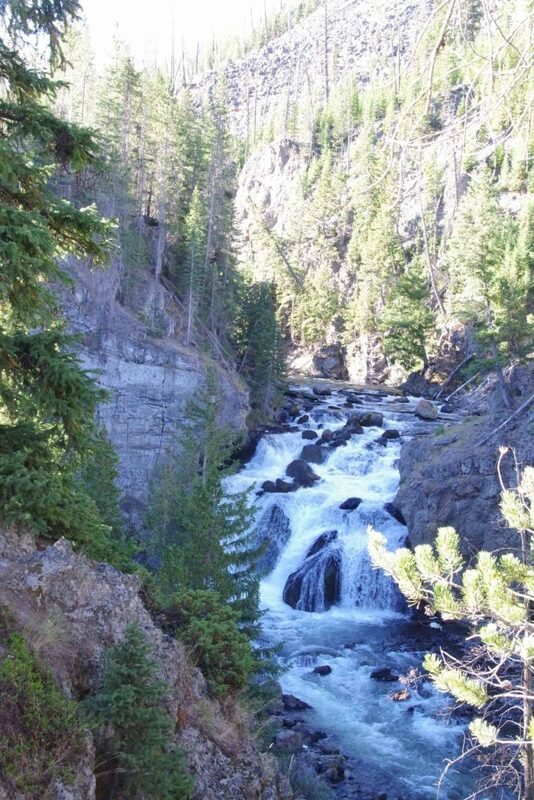 Where the canyon has eroded down the soft layers is Firehole Falls. 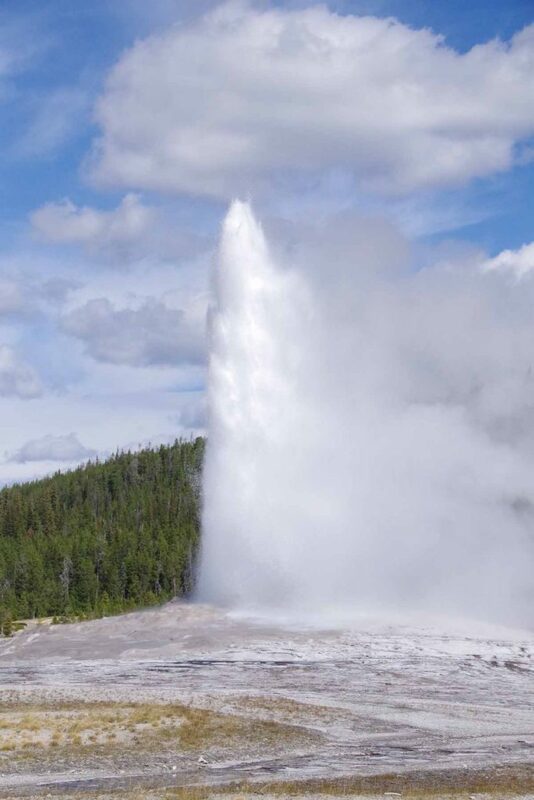 Once got on top of the hard layer it was relatively flat from there all the way to Old Faithful area. 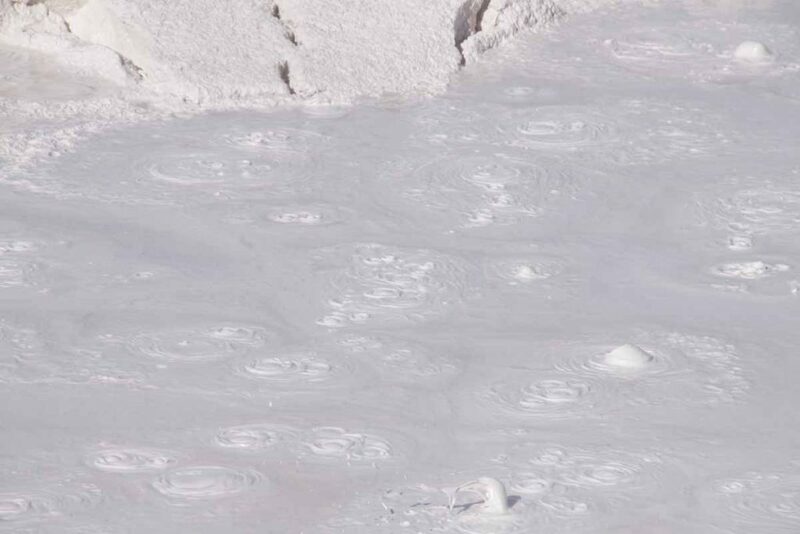 At 23 miles I walked around the Fountain Paint Pot area. 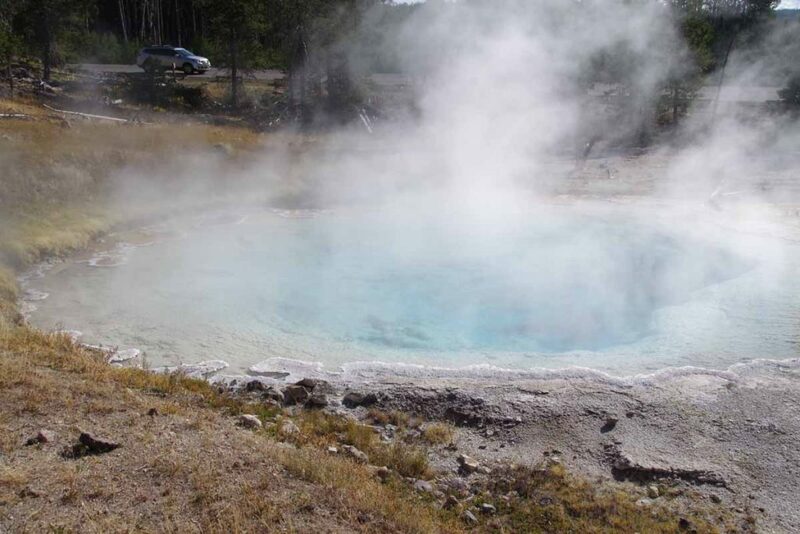 There were deep colored pools such as above. Also the namesake mud pots. 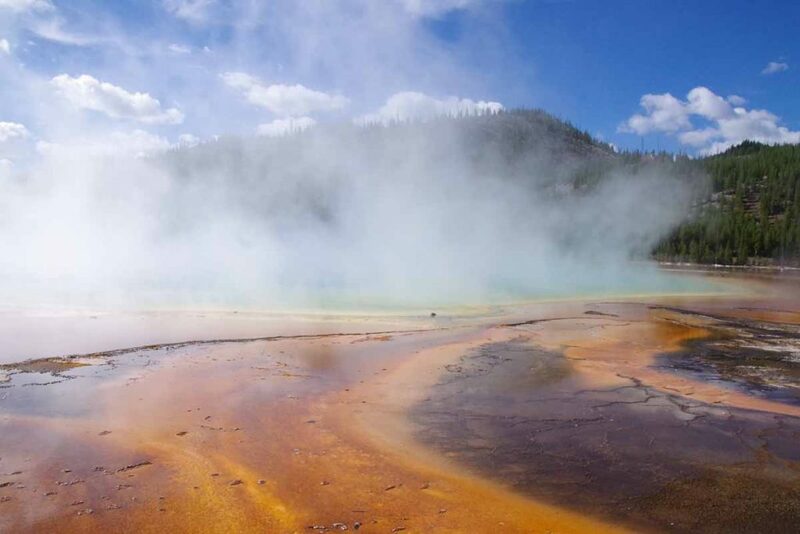 A few miles later was the Midway Geyser Basin with these colored pools. Shortly before lunch I made it to the Old Faithful complex area. It was surprisingly large area with parking lots, lodges, stores, etc. 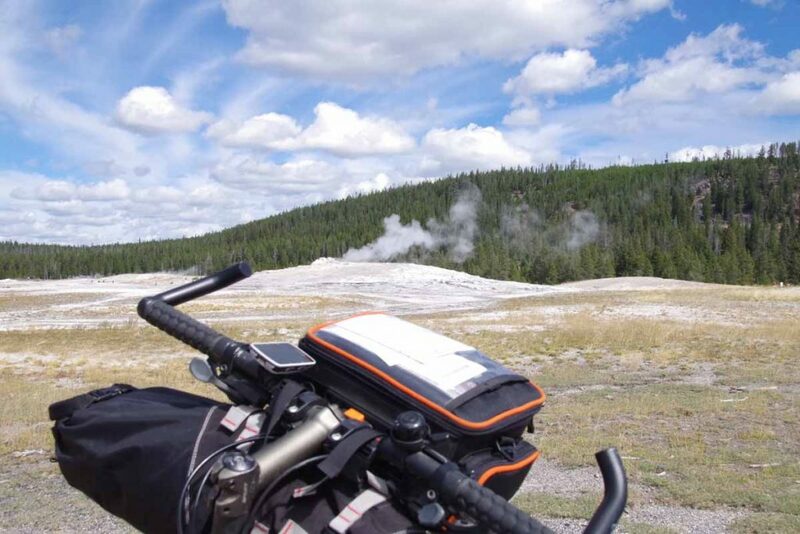 Almost a mile of cycling to finally reach the Old Faithful geyser itself. I was there at 11:45am and next eruption not expected for another 40 minutes. So myself and a lot of other people waited. Obligatory shot of the eruption that we waited for. After this some lunch and then back on the road. 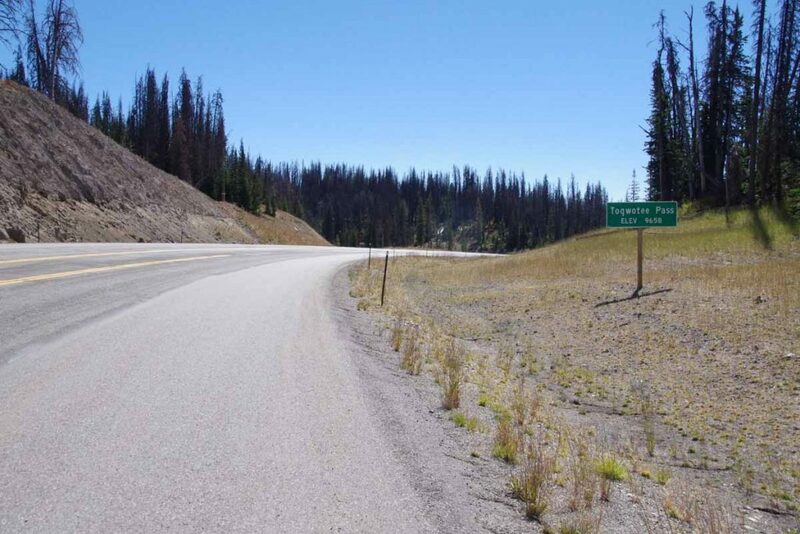 This next stretch climbed more than 1000ft to cross the Continental Divide twice. Second crossing. 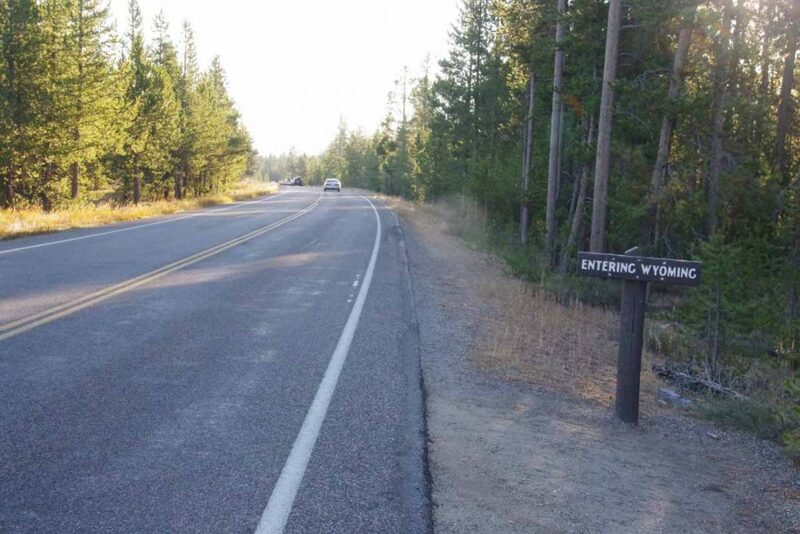 In this area I saw ~15 cyclists coming the other way without any gear. Looked like some sort of organized ride. 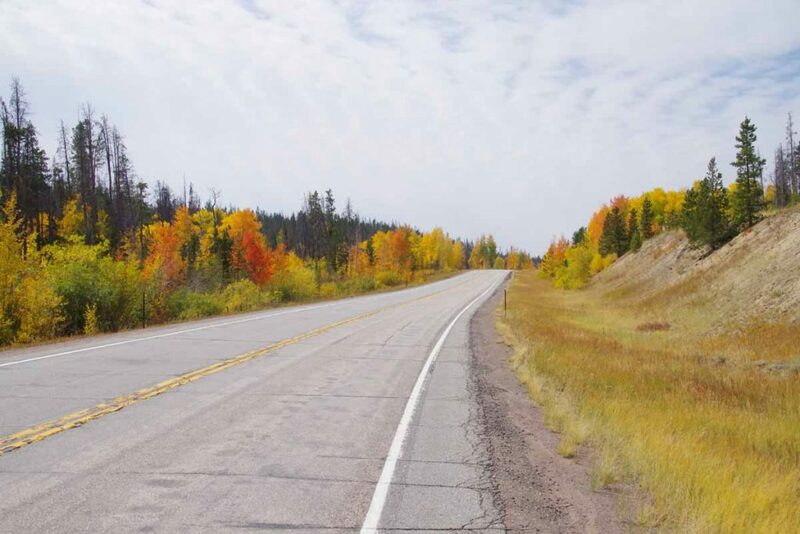 From the second crossing, a descent and then down to Yellowstone Lake. 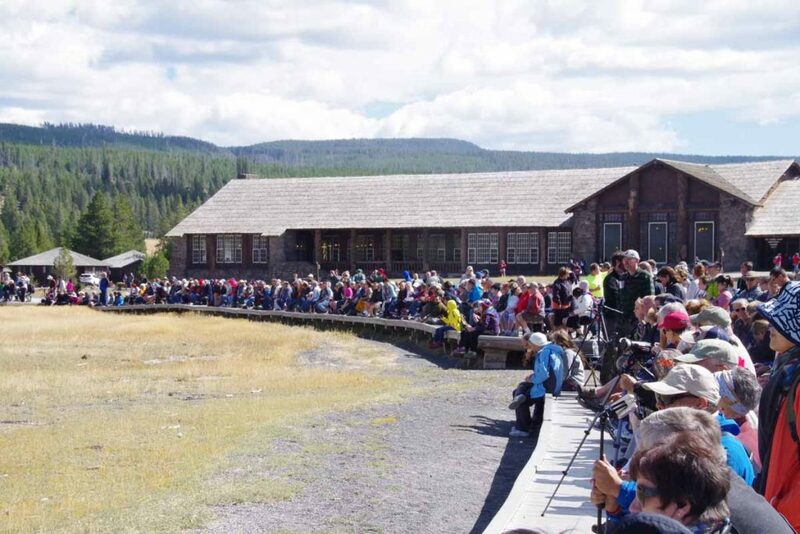 The Grant Village area was another large complex with campground, visitor center, restaurant and shops. I had a nice dinner before coming back to retire early. Unfortunately, I was awoken a little past 11pm. My spot was #172 and people arrived late for neighboring spot #174. However someone else had decided to take that spot since it appeared vacant and my spot didn’t have a car in the campsite, so they parked in my spot and started to noisily set things up. I awoke and at least pointed them at the next spot to sort things out. It wasn’t as cold as I expected overnight and again above freezing. I packed up and then cycled for a buffet breakfast before setting off. 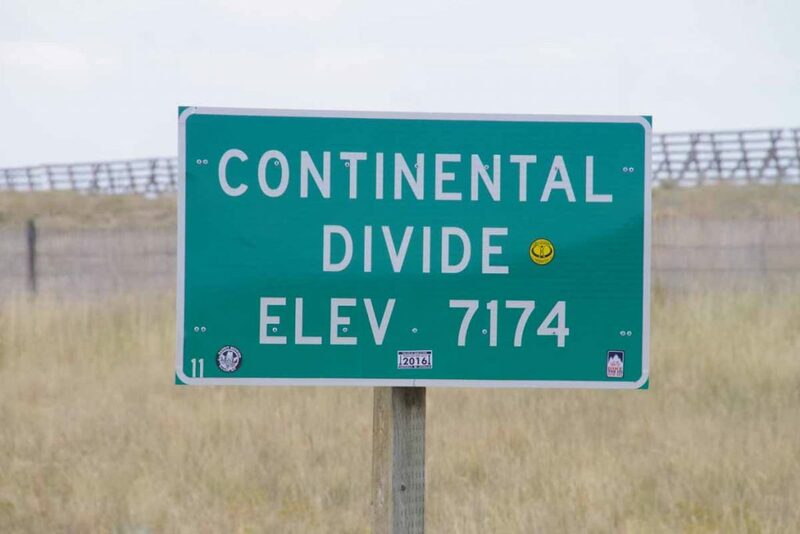 Started the day with another Continental Divide crossing. This one had fairly little climbing. After this somewhat level along Lewis Lake. Past Lewis Falls at the other side. After this the canyon again appeared as the Lewis River cut through softer layers. However, the road stayed high until last few miles before the South Entrance where there was a good descent of almost 1000ft. 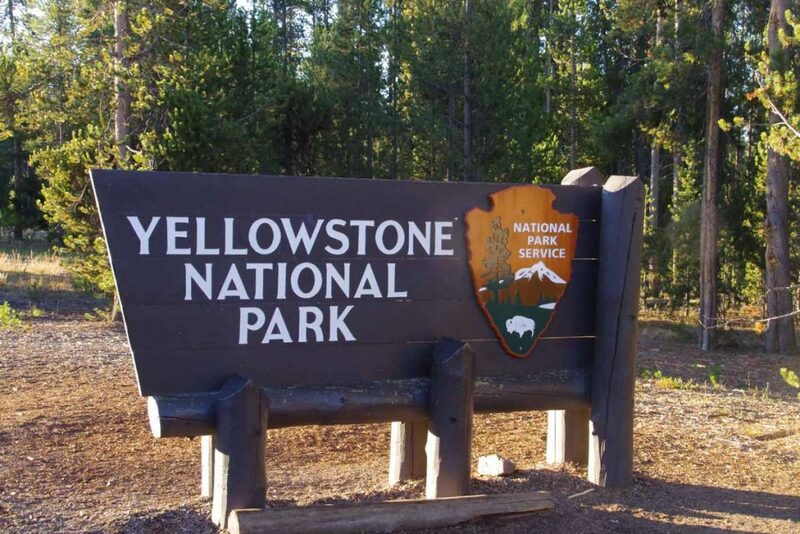 I was now out of Yellowstone and in small gap before reaching Grand Teton. The Berry Fire had recently shut this road for 10 days and there was information here about the fire. We crossed right through some burnt out areas. The information sign on the lookout is shown below. 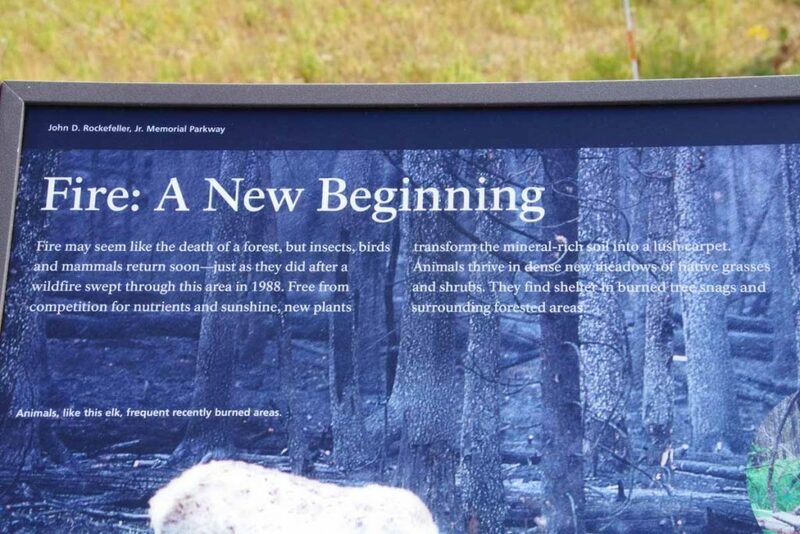 It described the effects of the 1988 fires in this area as well as regrowth. 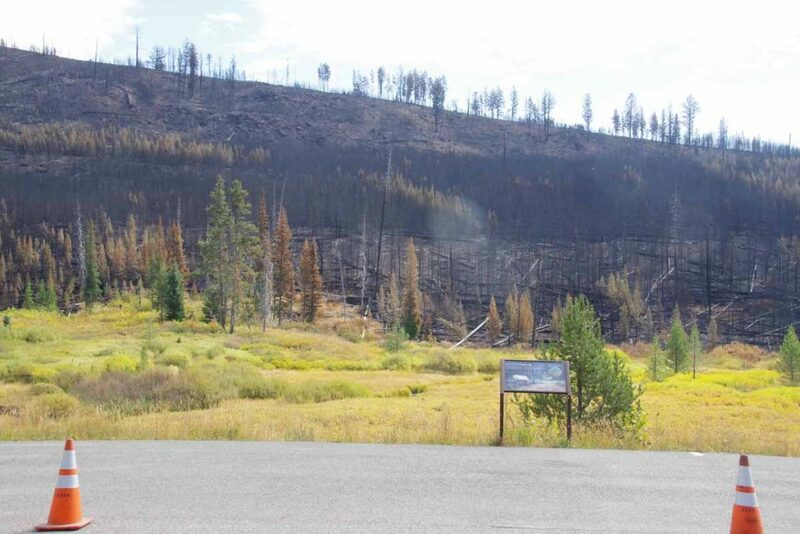 Interestingly enough almost exactly 28 years ago (weekend after Labor Day 1988) I also made a (non-cycling) trip to Yellowstone and passed through this recently burned area. I wonder how they will update the signs this time. 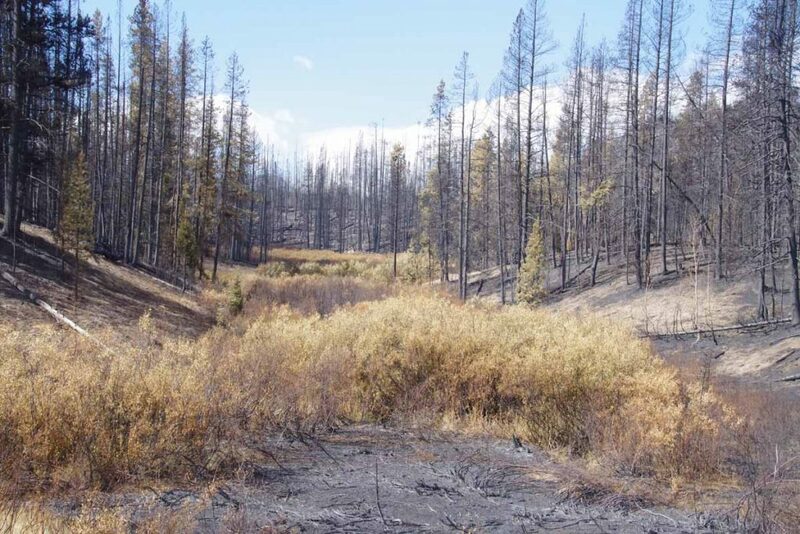 Here was another area of very recent burn. 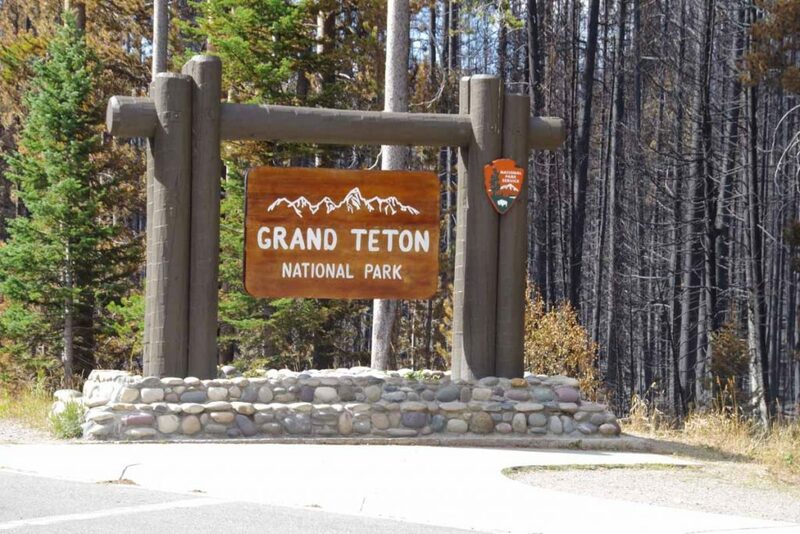 A little later I came to Grand Teton Park entrance itself. The road had a nice shoulder in this area and throughout the park. I encountered these cyclists at Colter Bay. 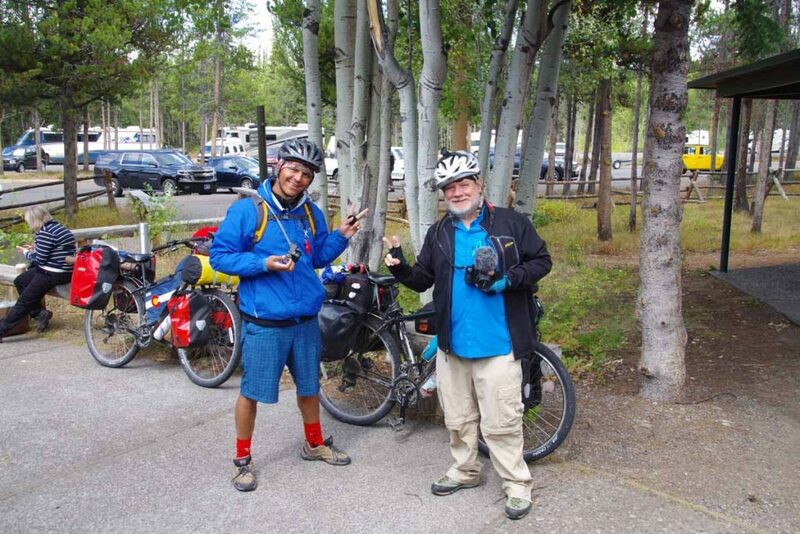 Self described bicycle journalists had started in Breckenridge and were roughly following the Great Divide northbound and interviewing people they met. Had a good lunch in Colter Bay before cycling the last miles for the day. Road leaving the park and heading east. 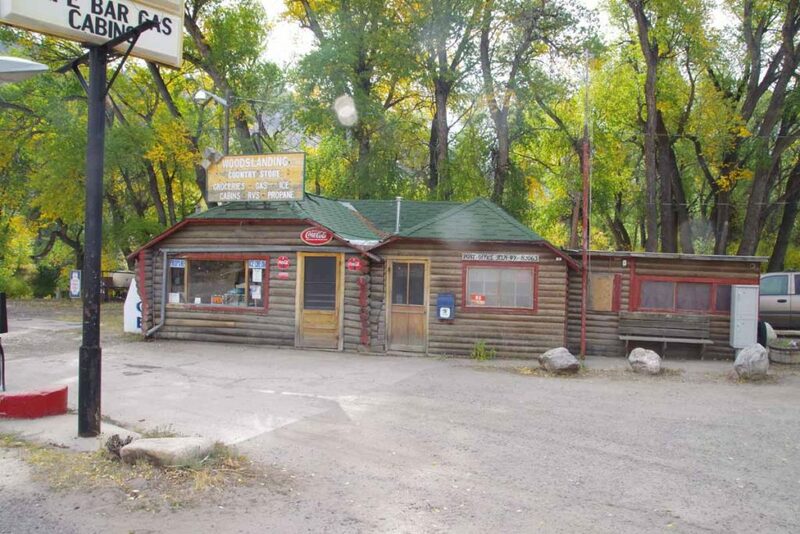 I had a hostel room at resort ~8 miles east of Moran Junction.